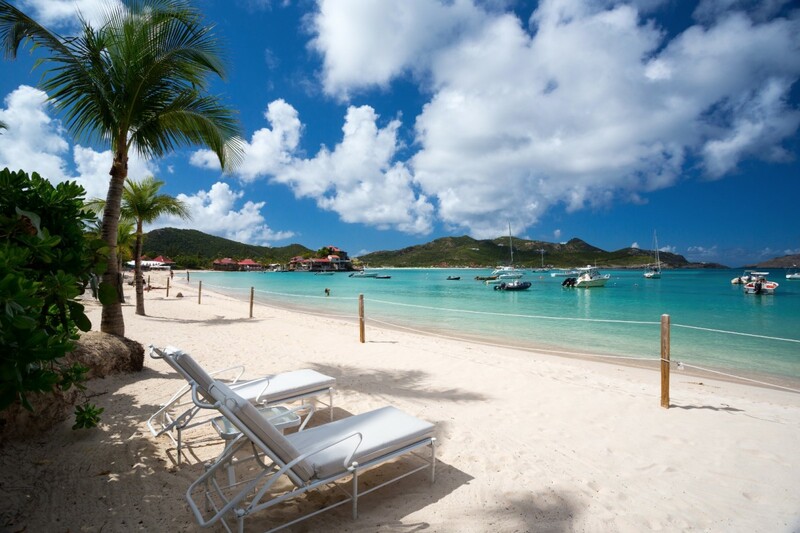 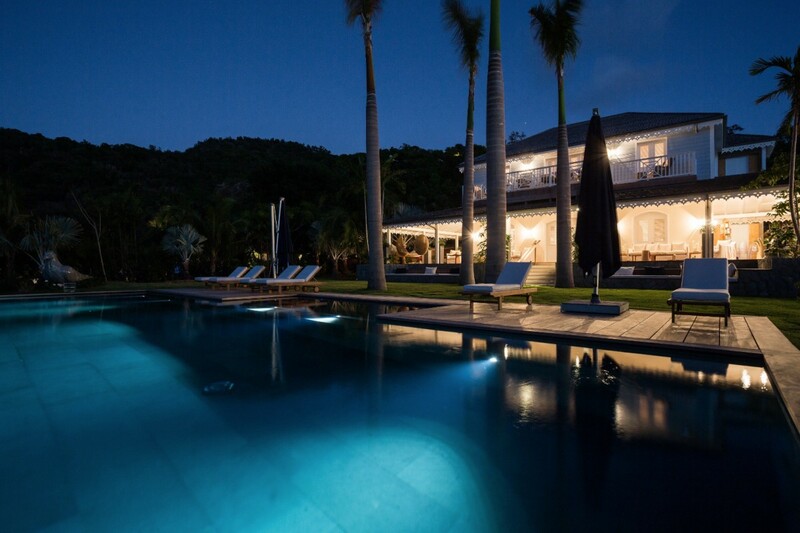 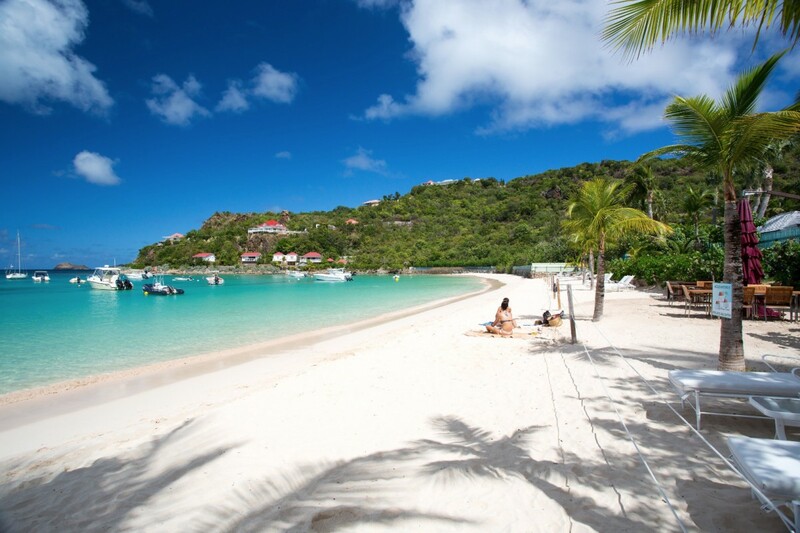 Villa Manoir de St Jean St Barts. 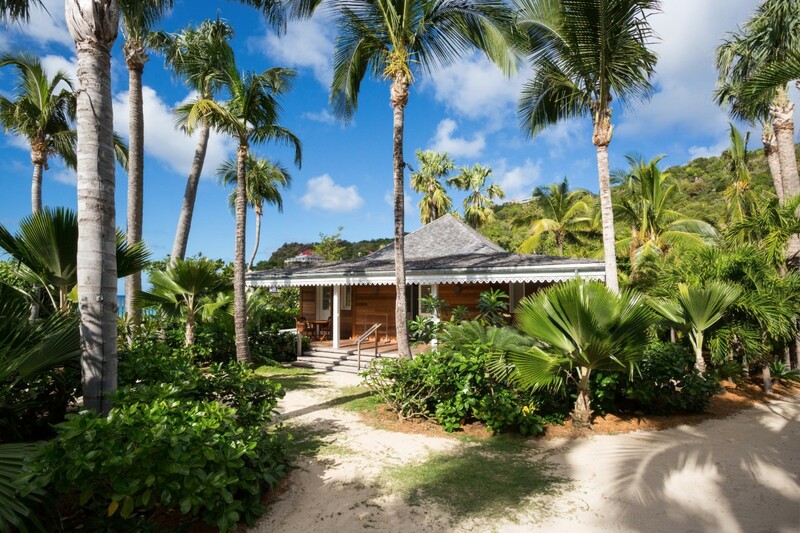 As its name implies, the Villa Manoir de St Jean is not just a single villa but a small, private "camp" with a main house, cottages, pavilions and expansive private grounds. 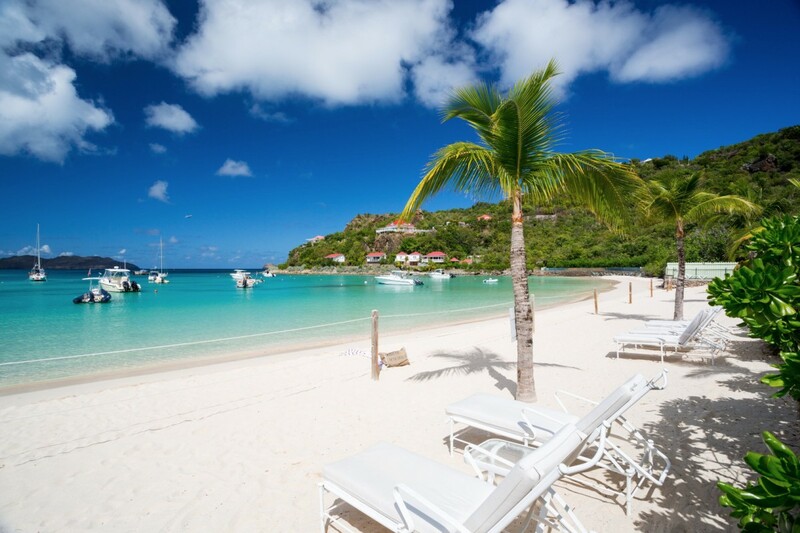 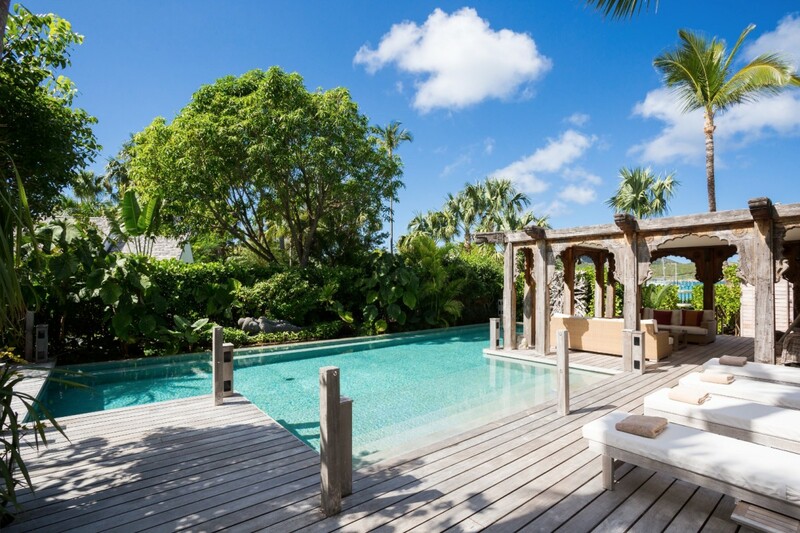 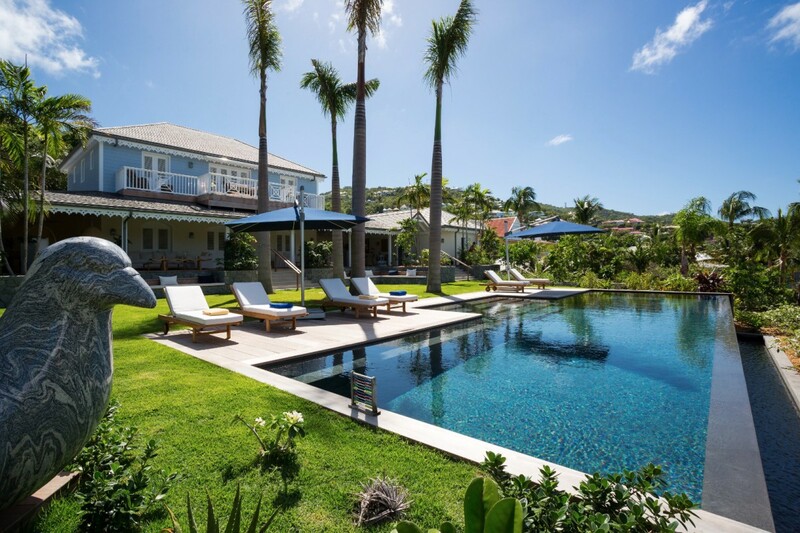 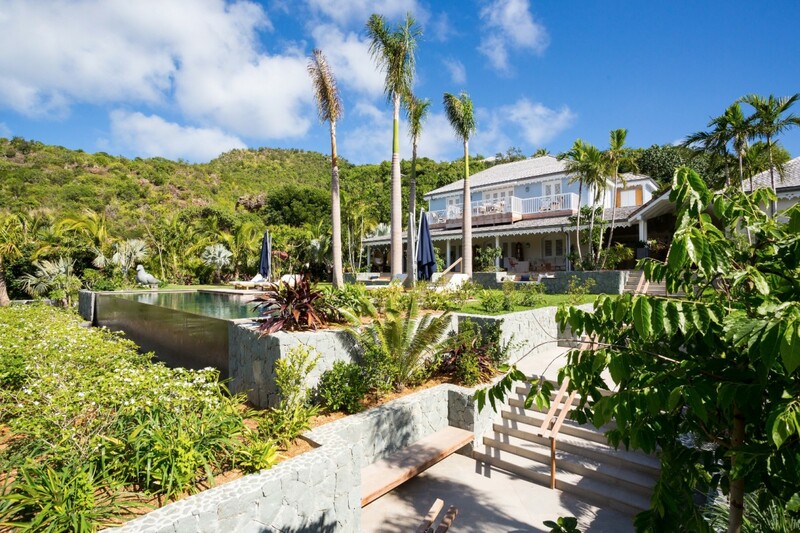 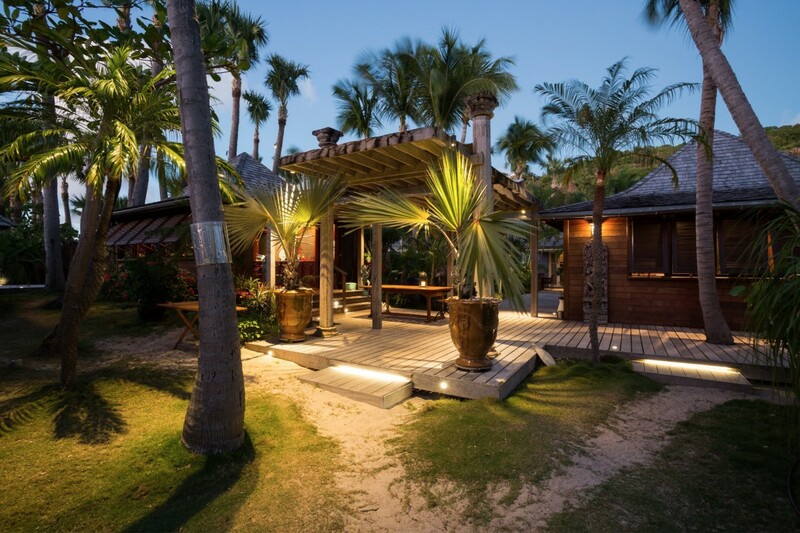 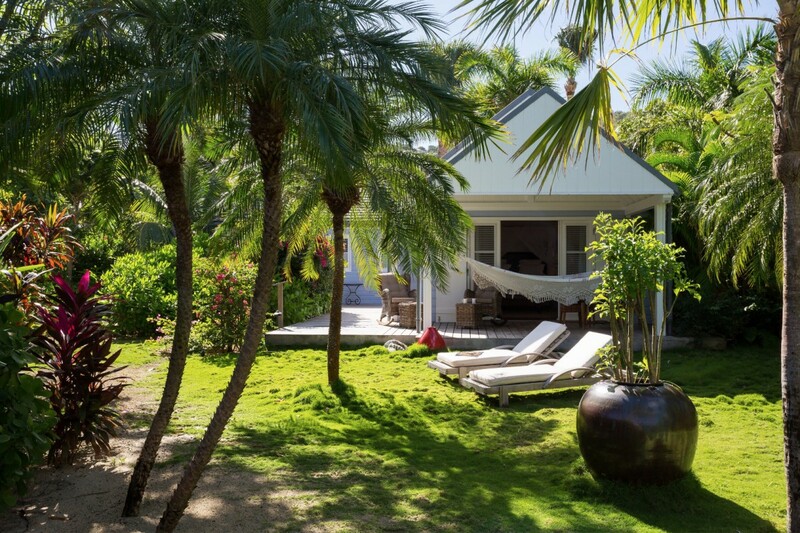 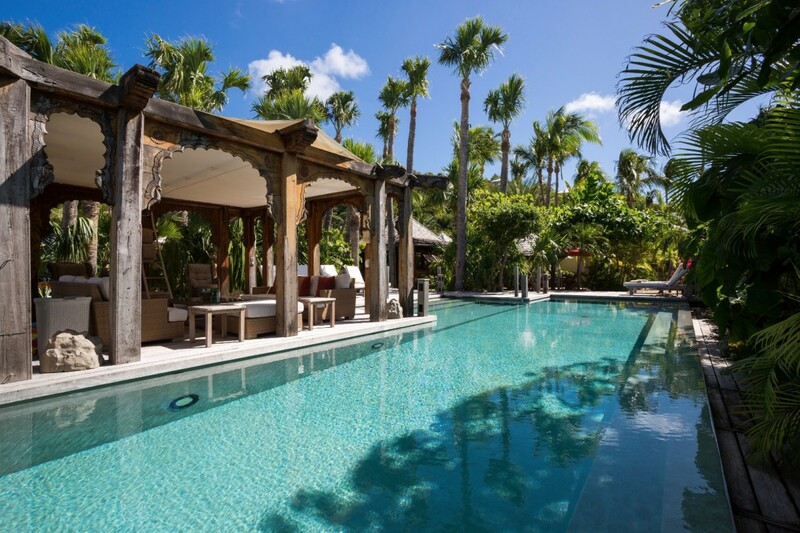 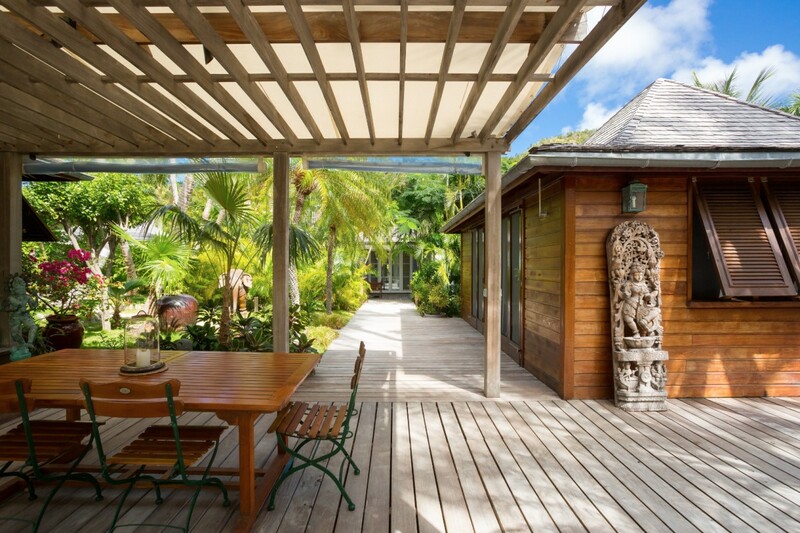 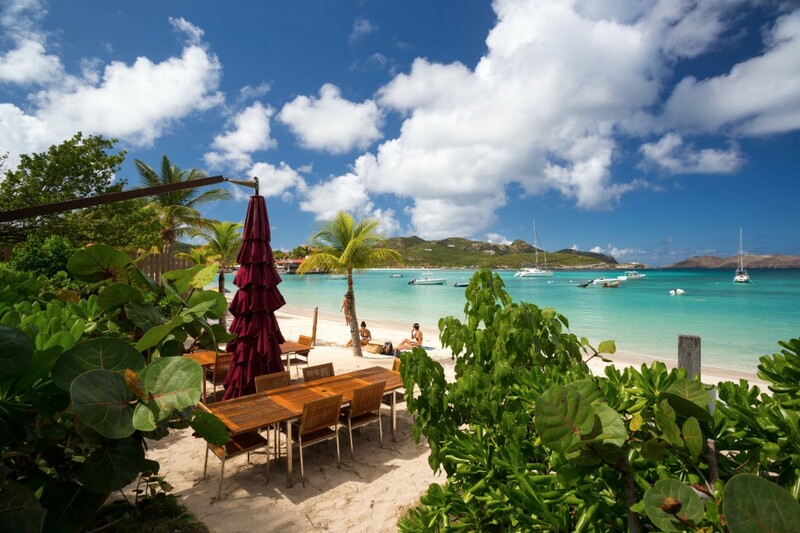 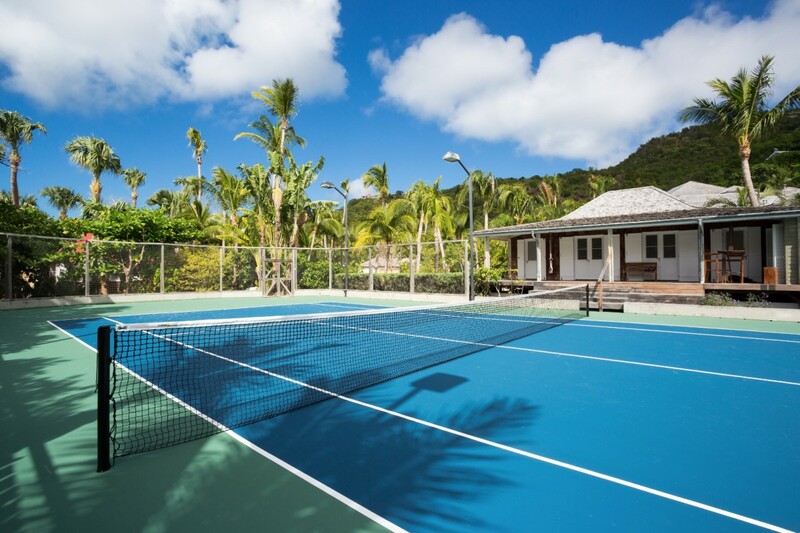 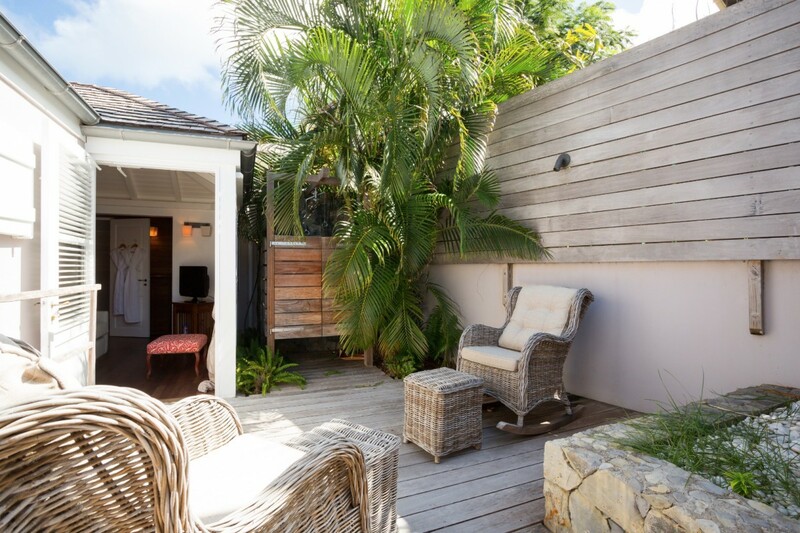 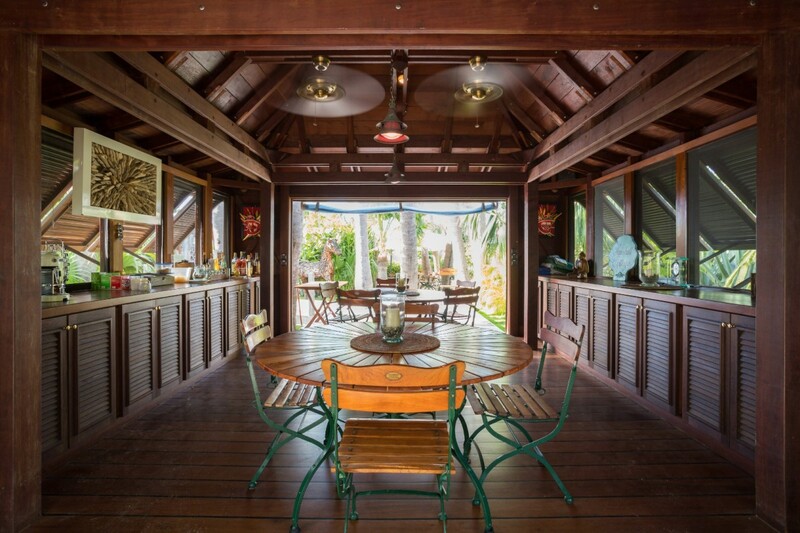 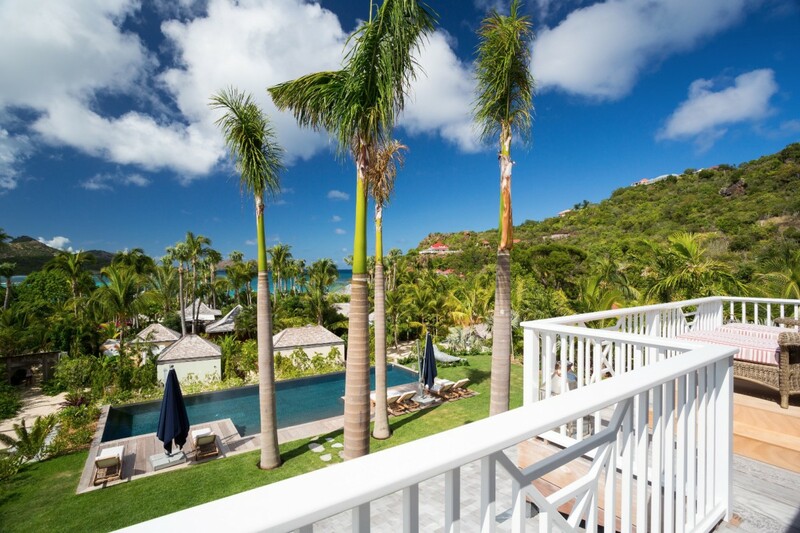 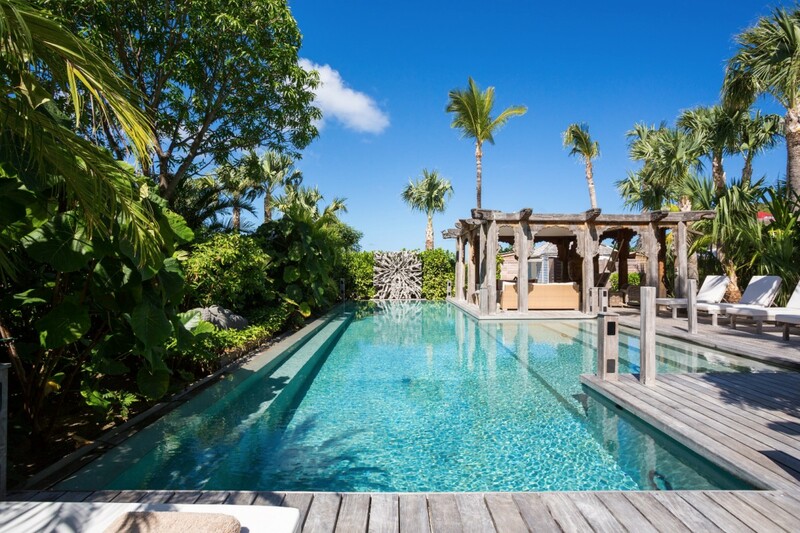 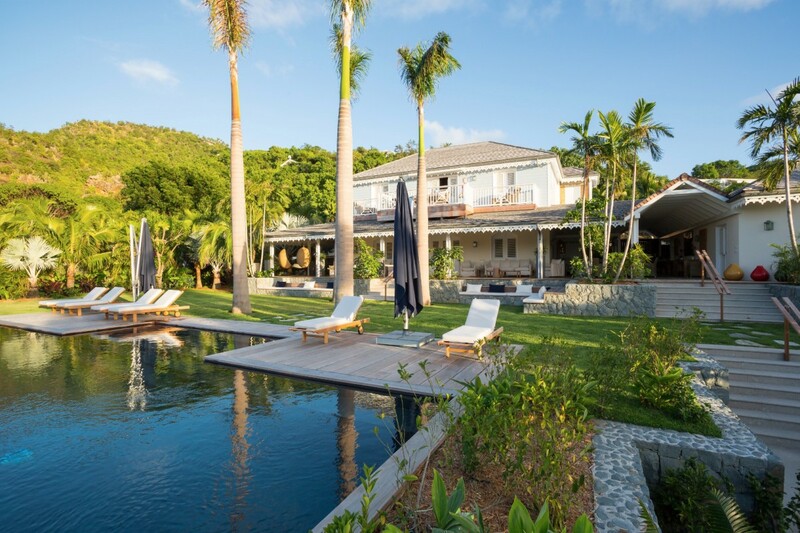 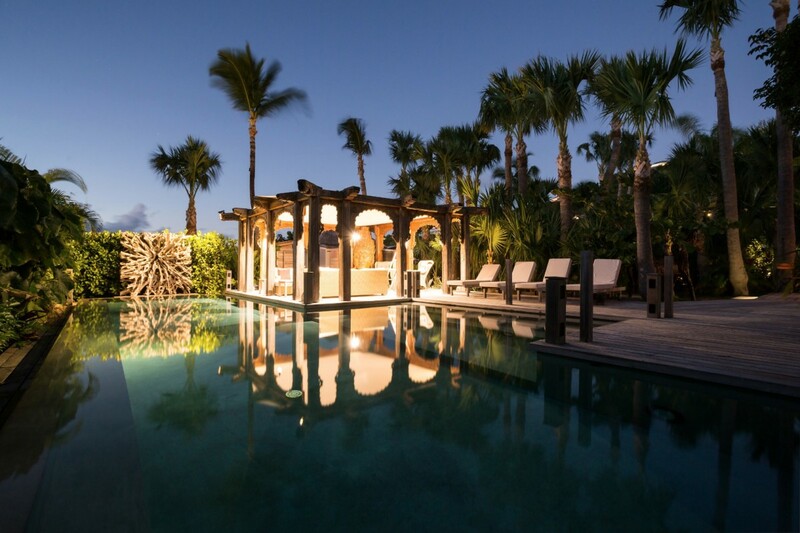 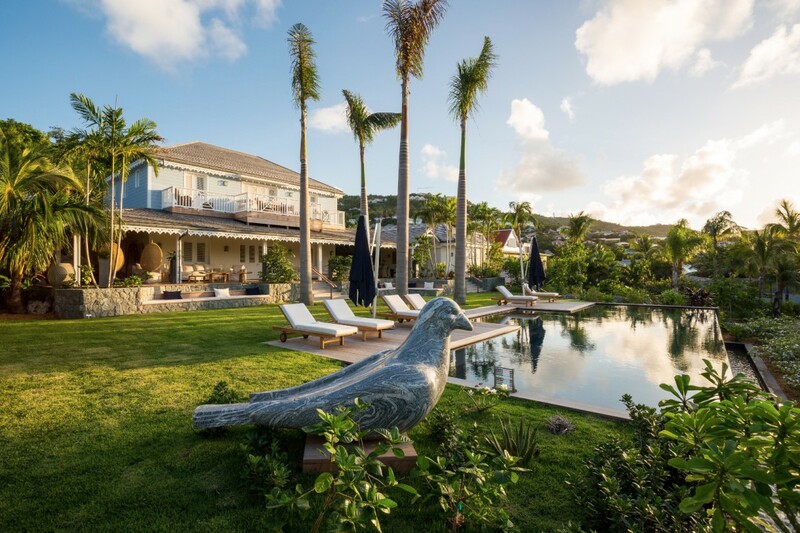 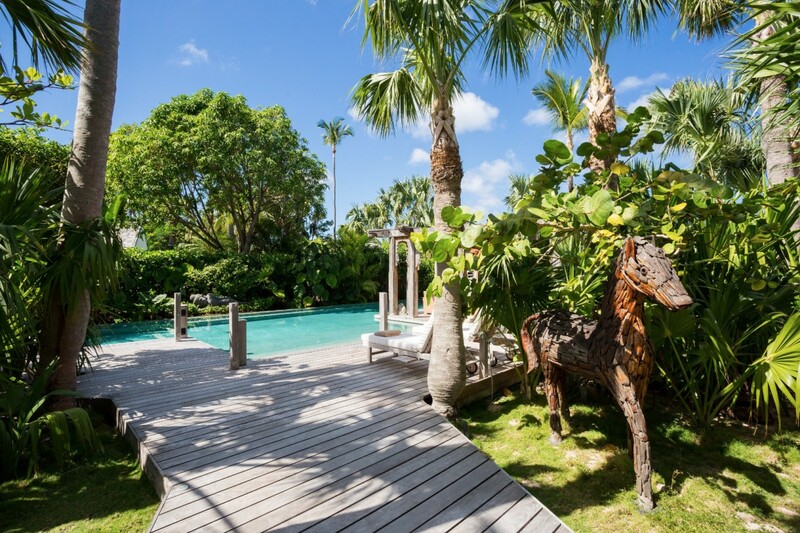 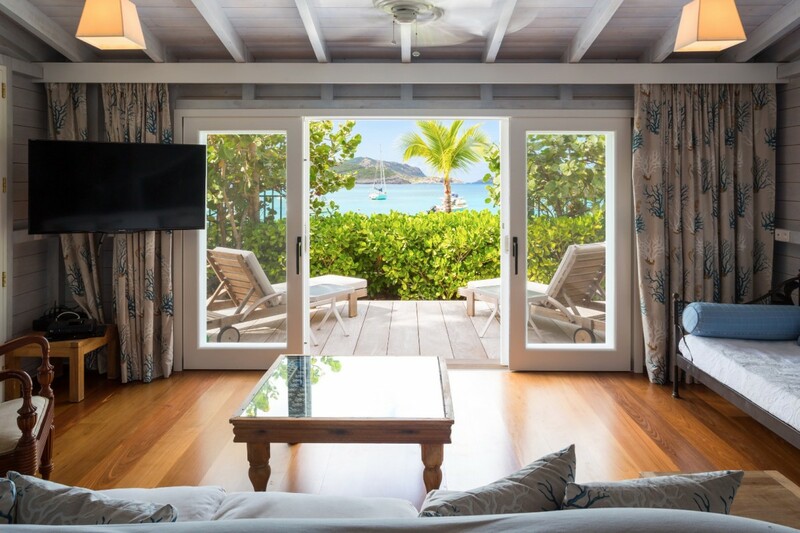 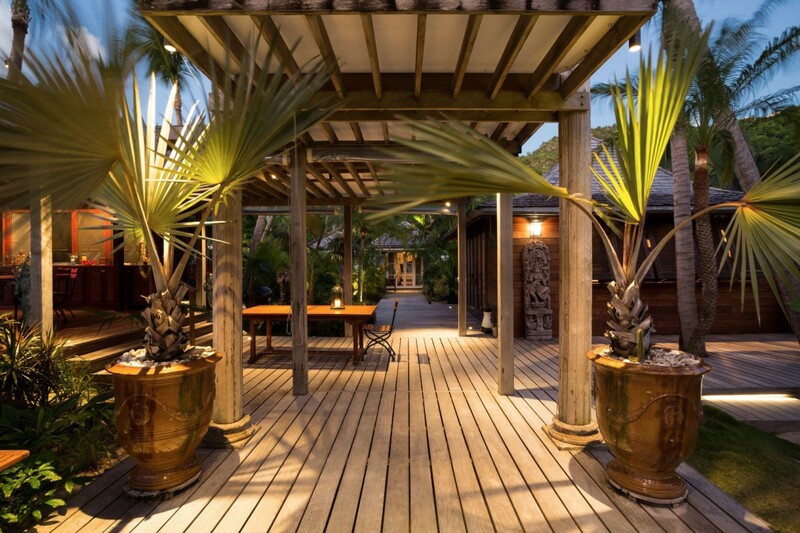 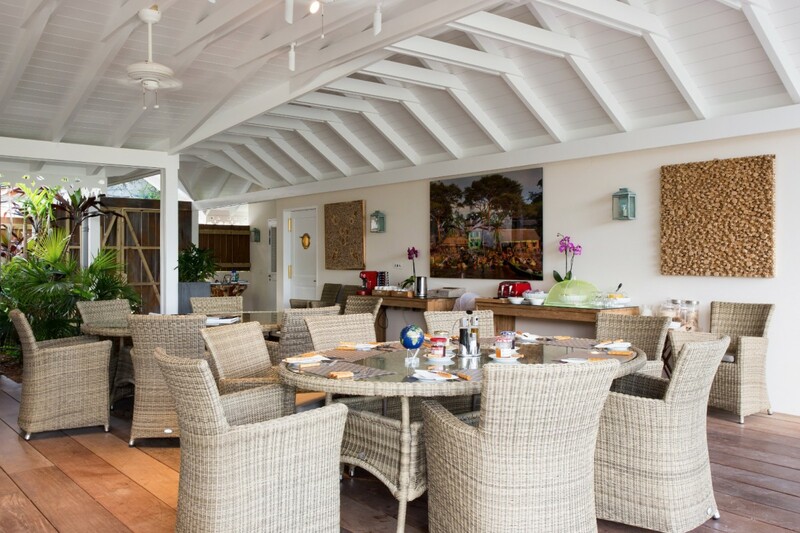 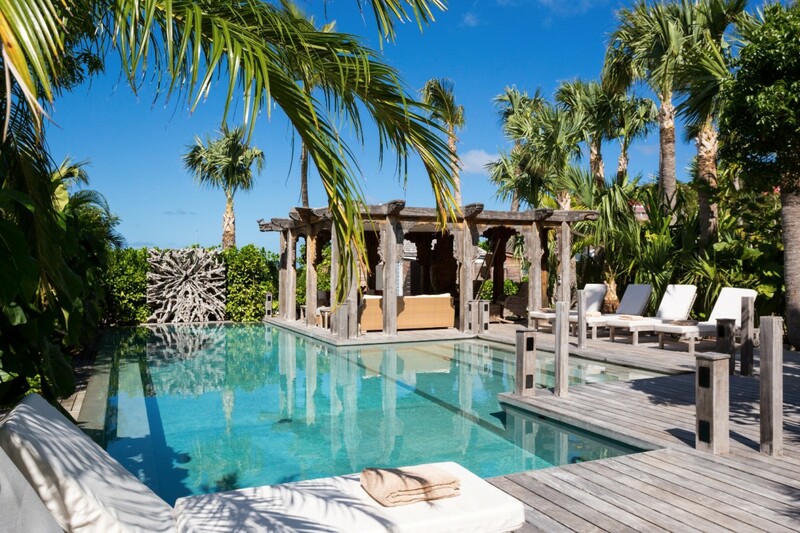 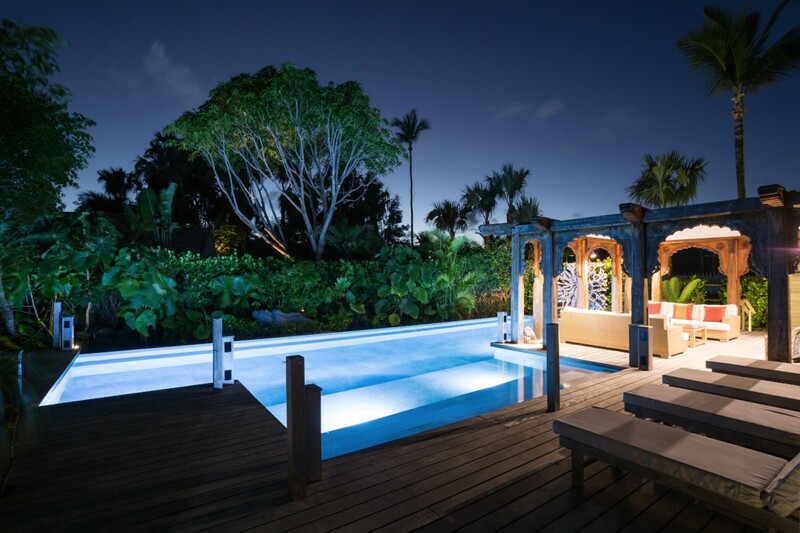 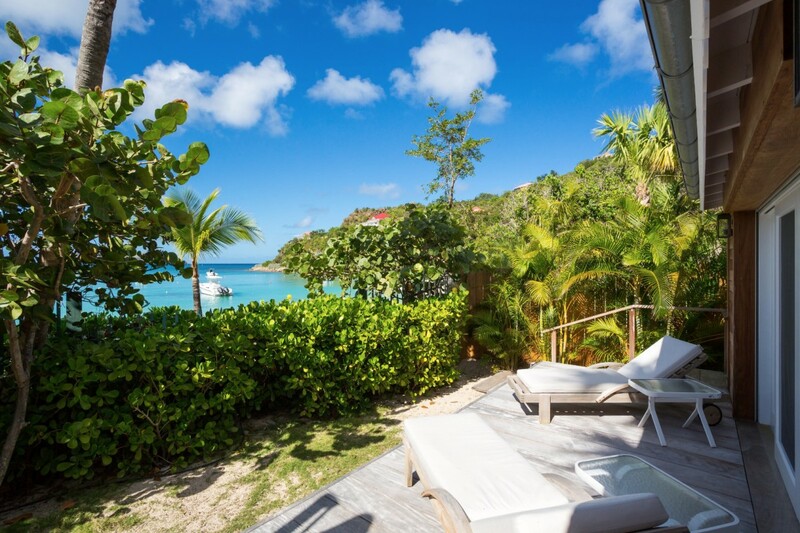 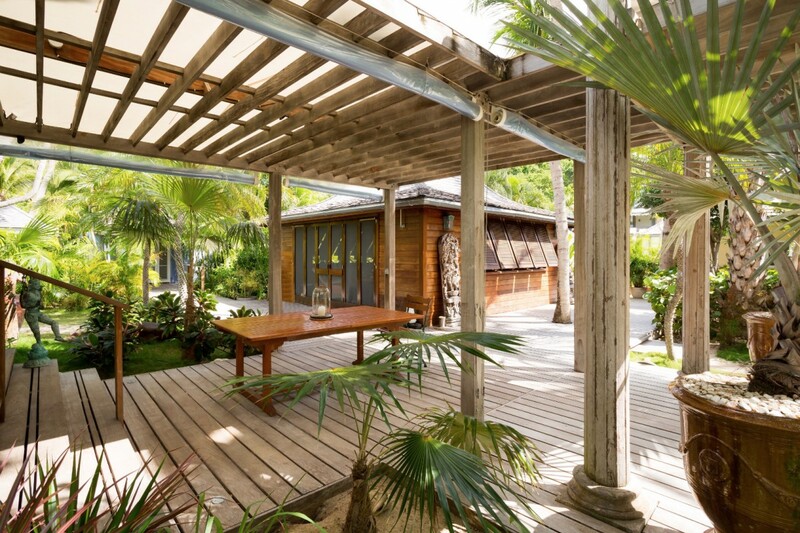 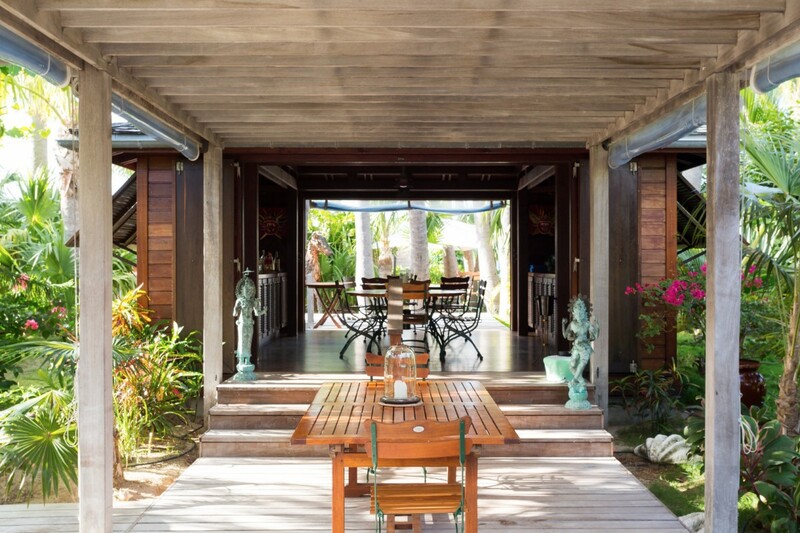 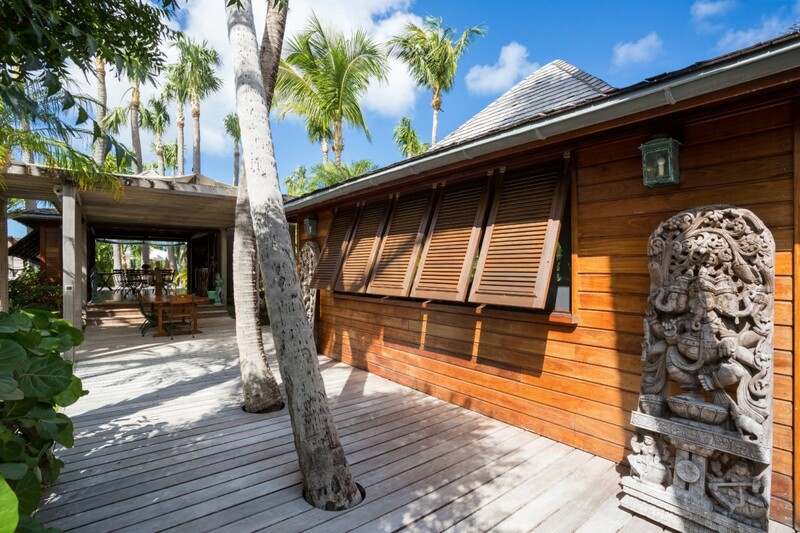 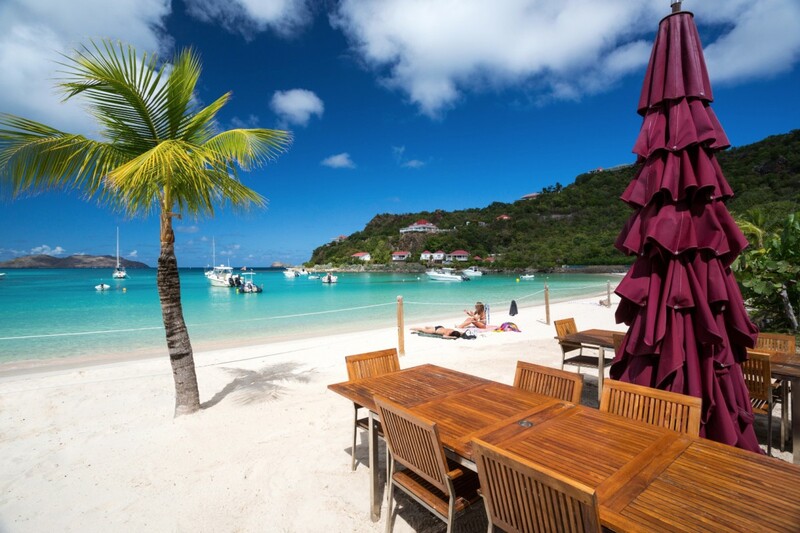 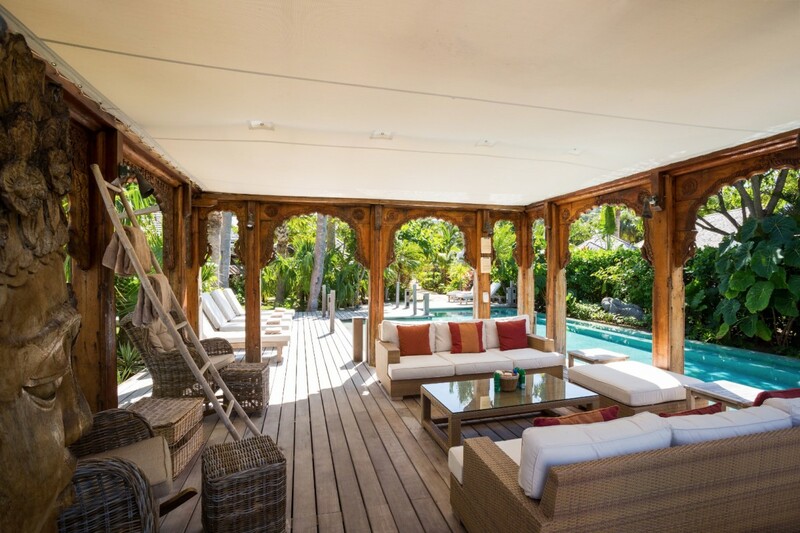 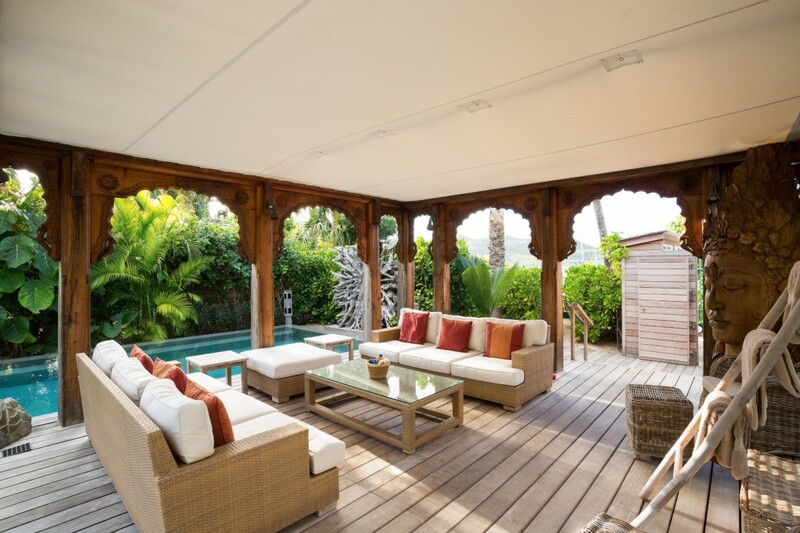 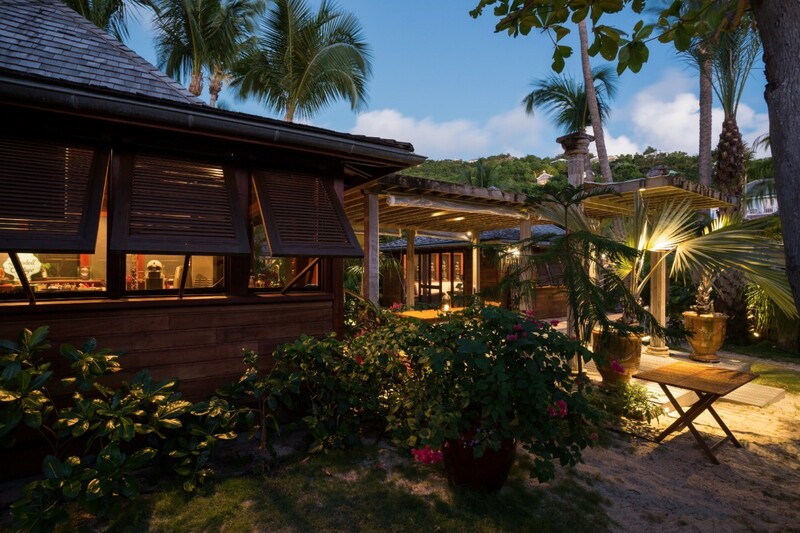 Set along the gorgeous Saint Jean waterfront in St. Barts, it has eleven bedrooms and makes for the ultimate family retreat or even a truly unforgettable destination event. 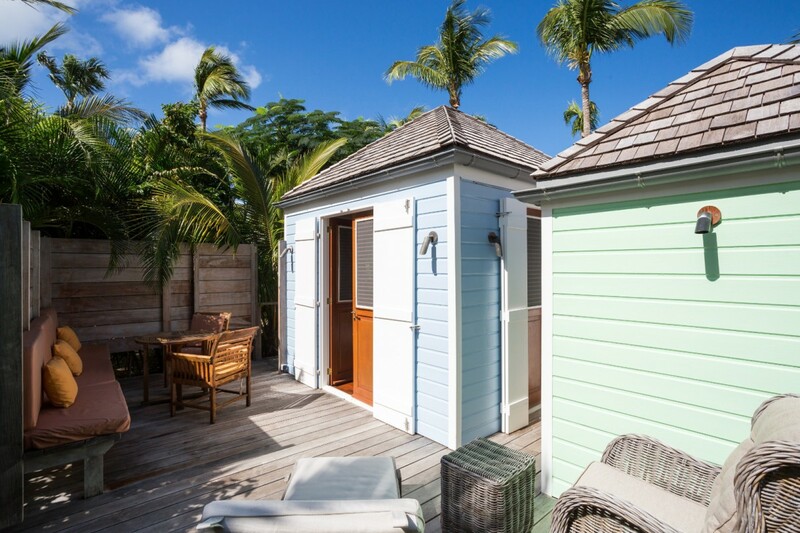 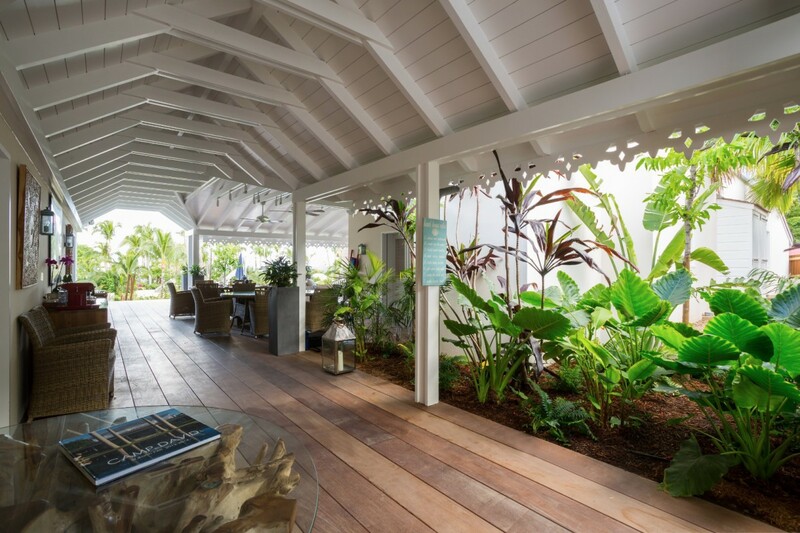 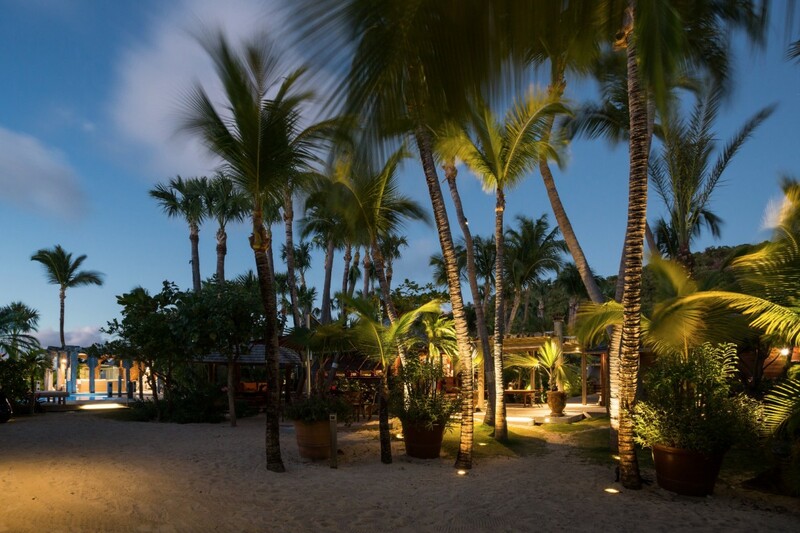 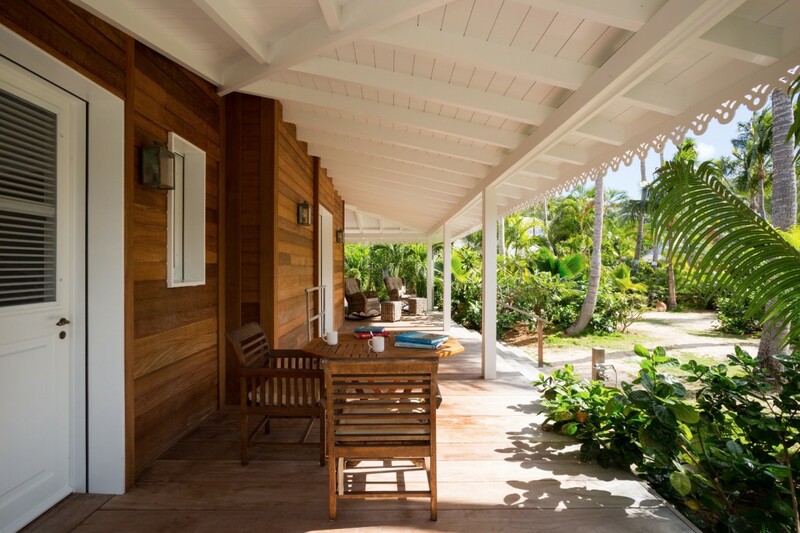 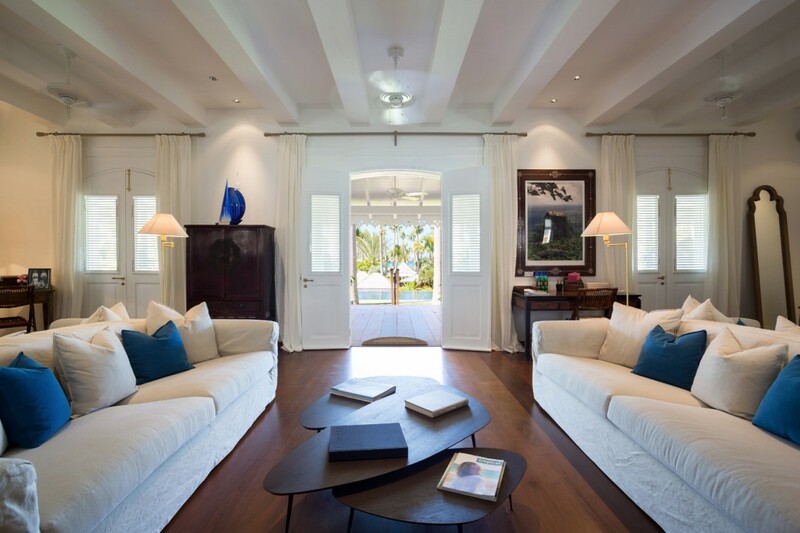 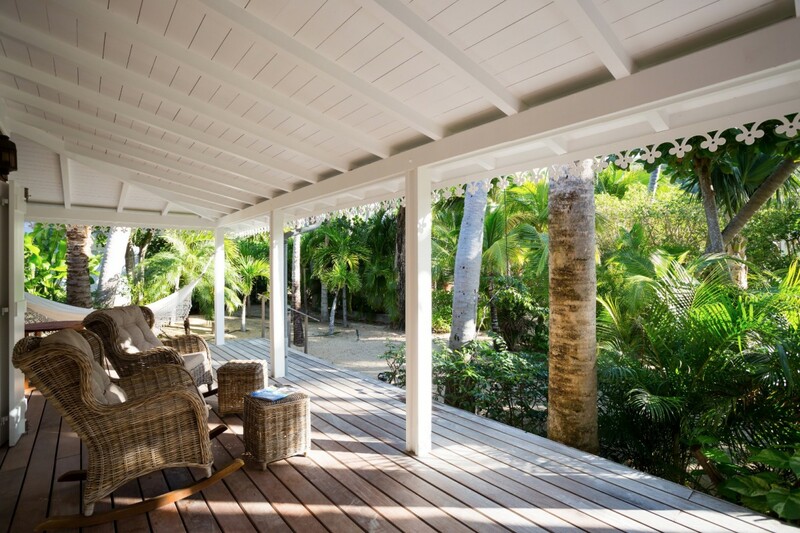 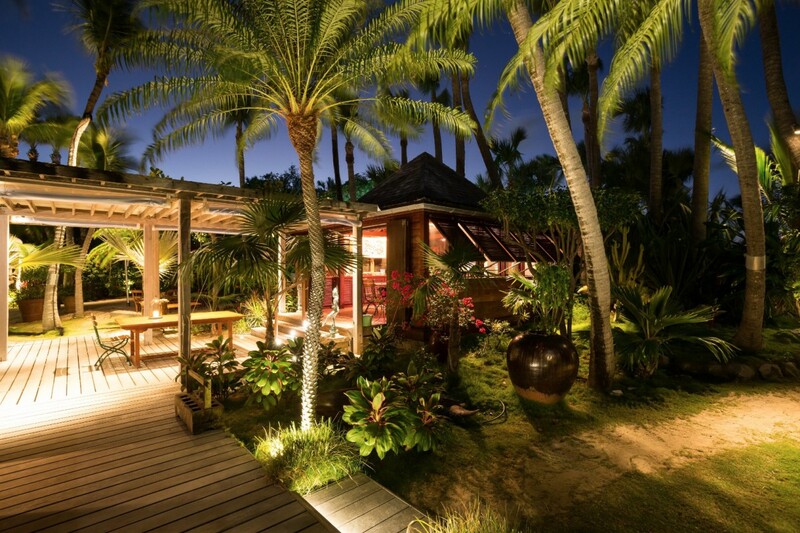 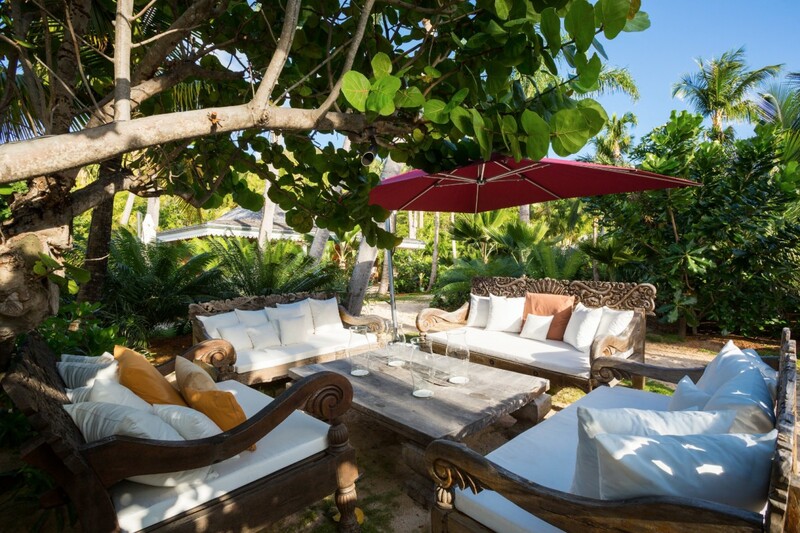 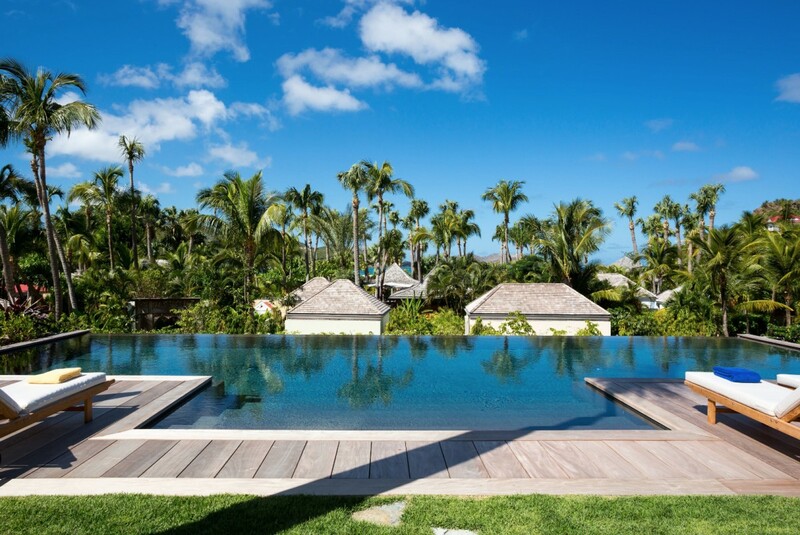 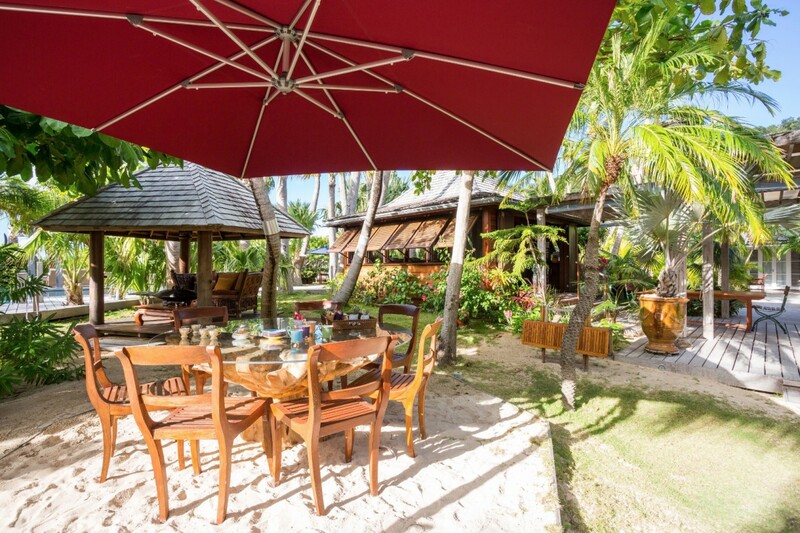 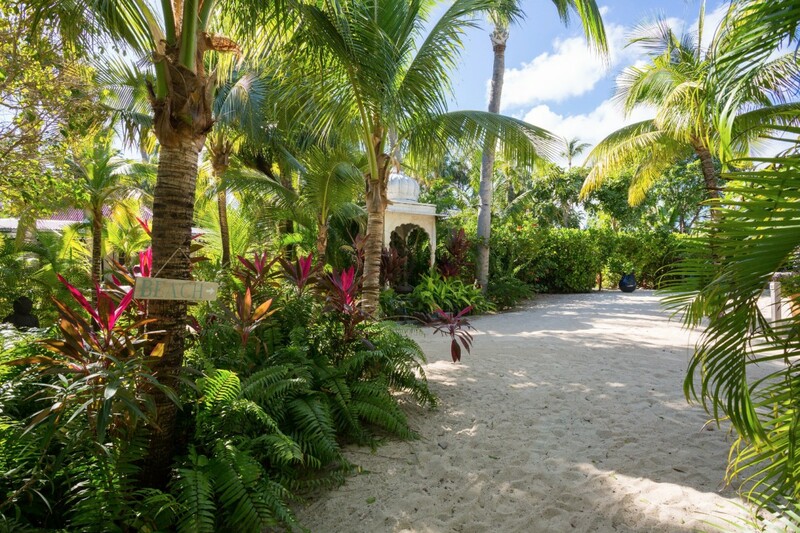 The amazing amenities of the villa begin with its large stretch of private beachfront. 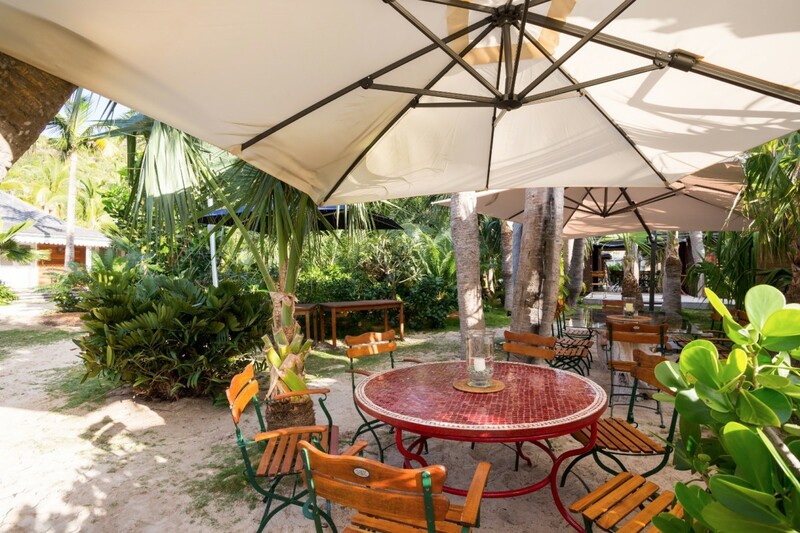 Subtly separated from the public beach, it is a fantastic space at all hours and offers amazing views. 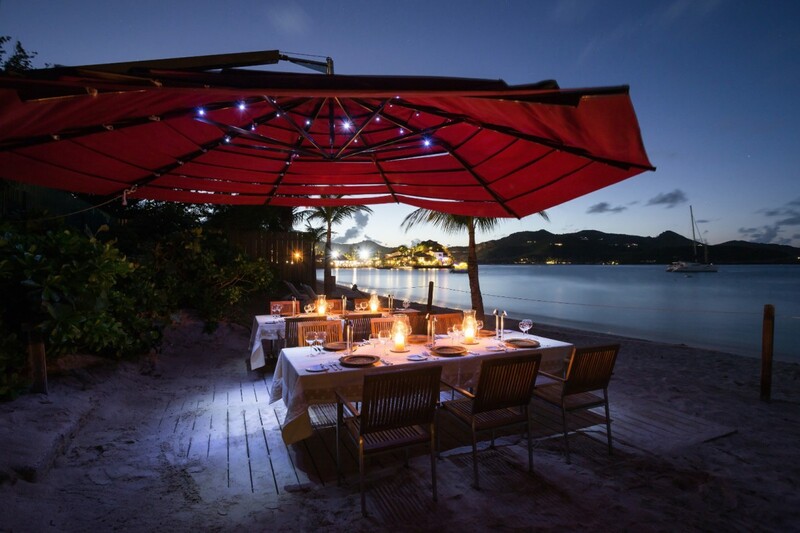 It is furnished with an array of al fresco dining tables that each seat six, enabling your group to enjoy formal dinners on the beach! 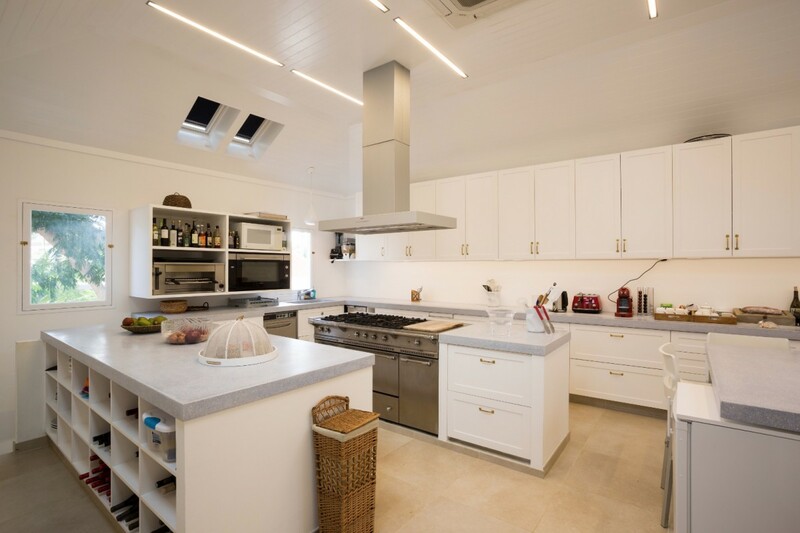 A kitchen nearby guarantees that these meals are simple and easy to prepare, and yet there is much more to discover. 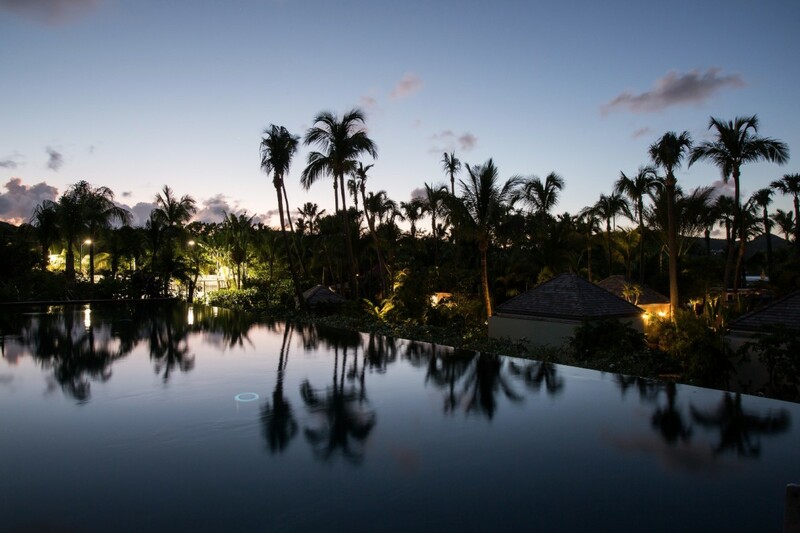 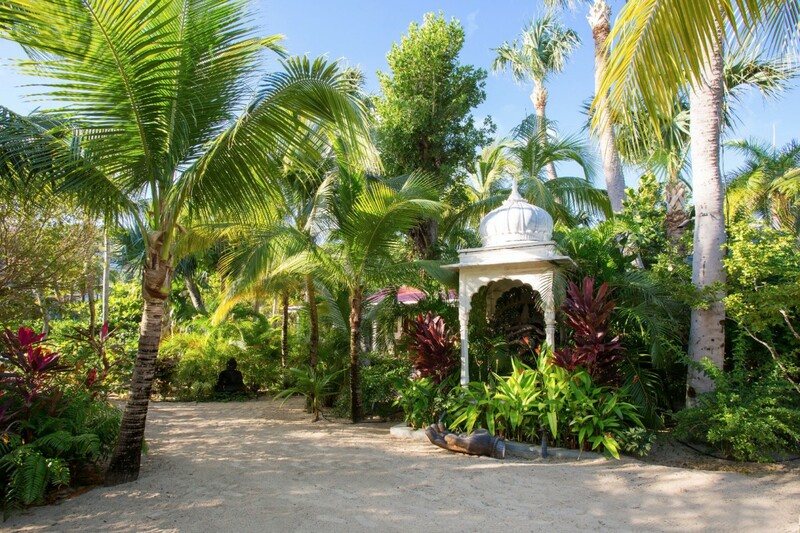 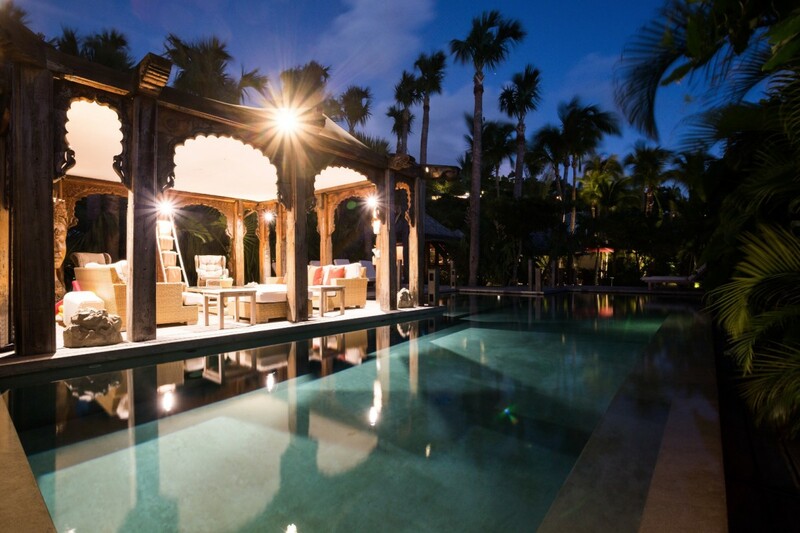 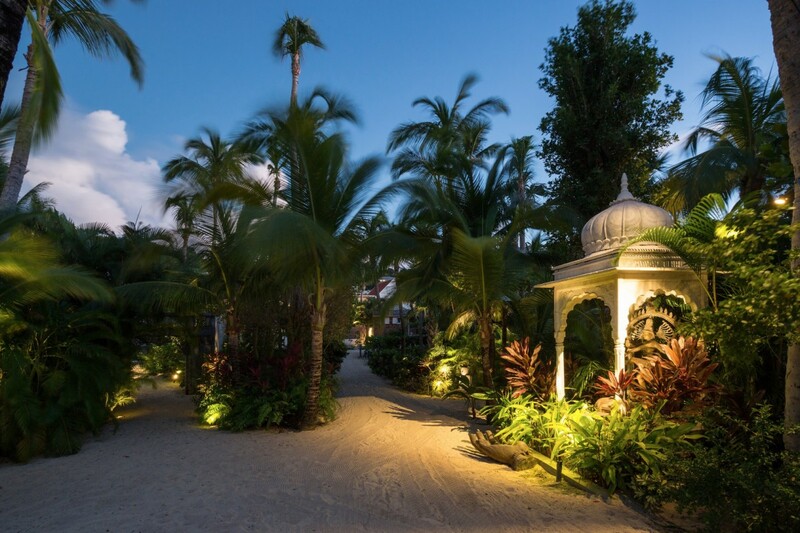 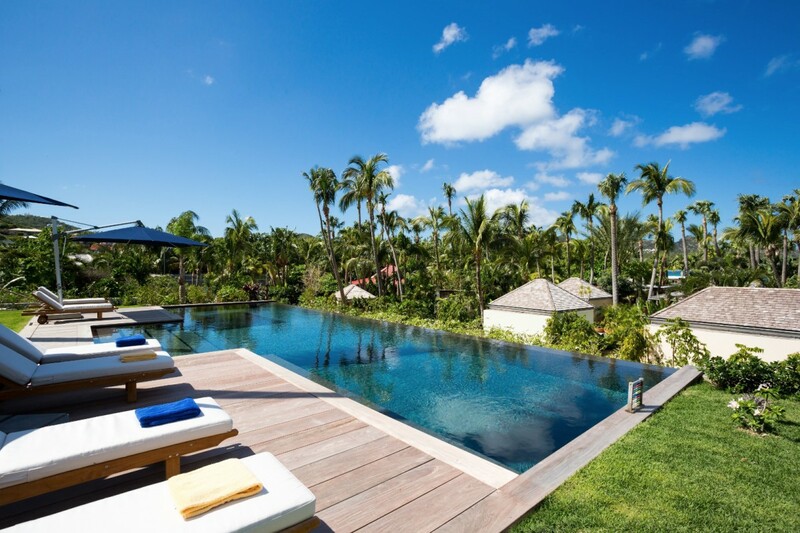 The enormous private grounds feature two pools, one with an Indian temple and a separate dining pavilion nearby. 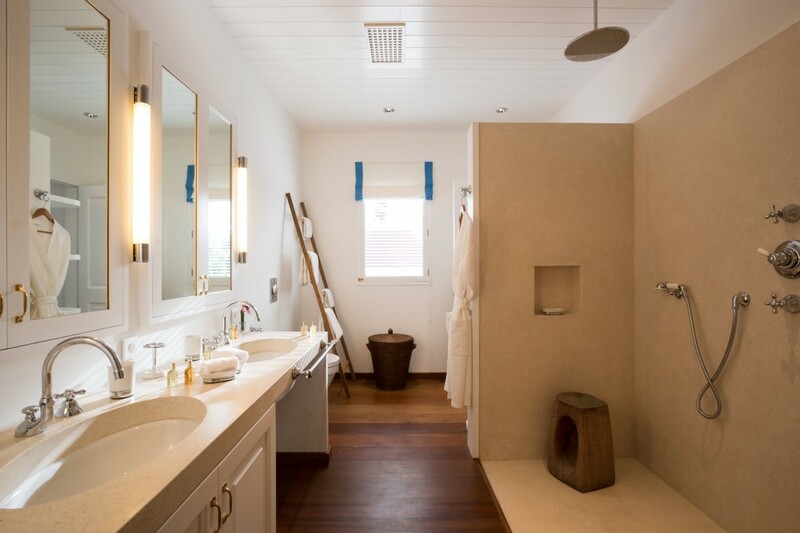 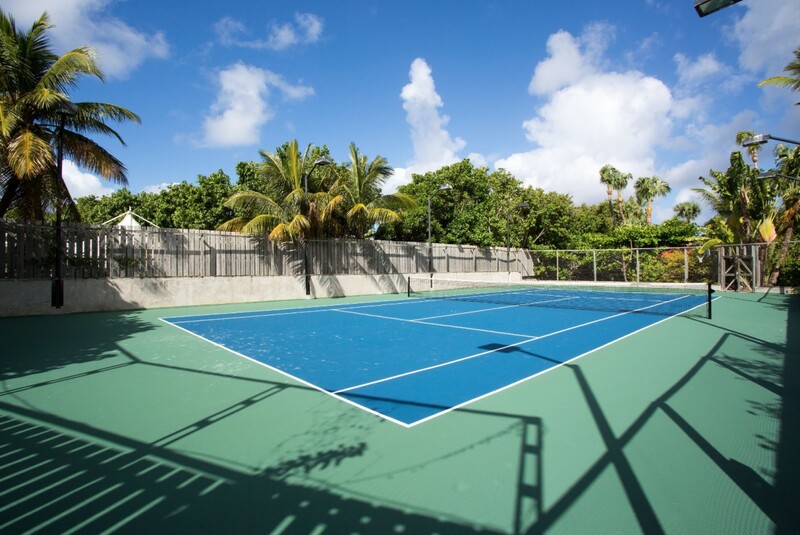 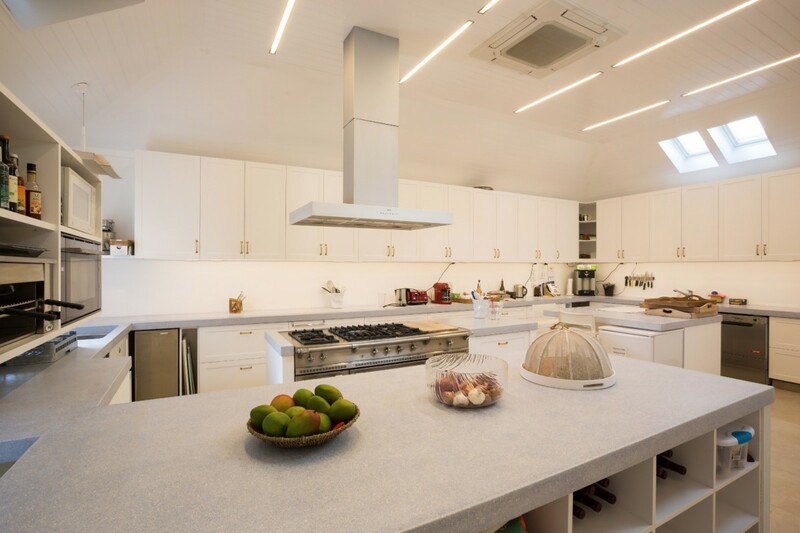 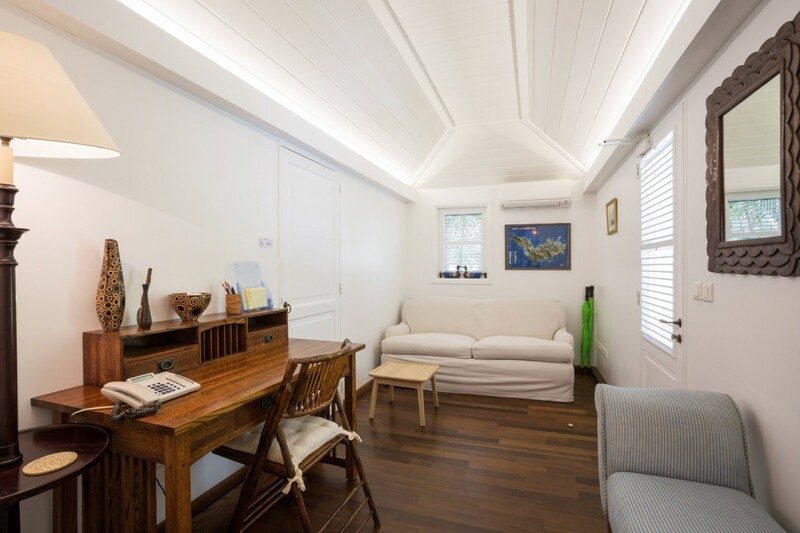 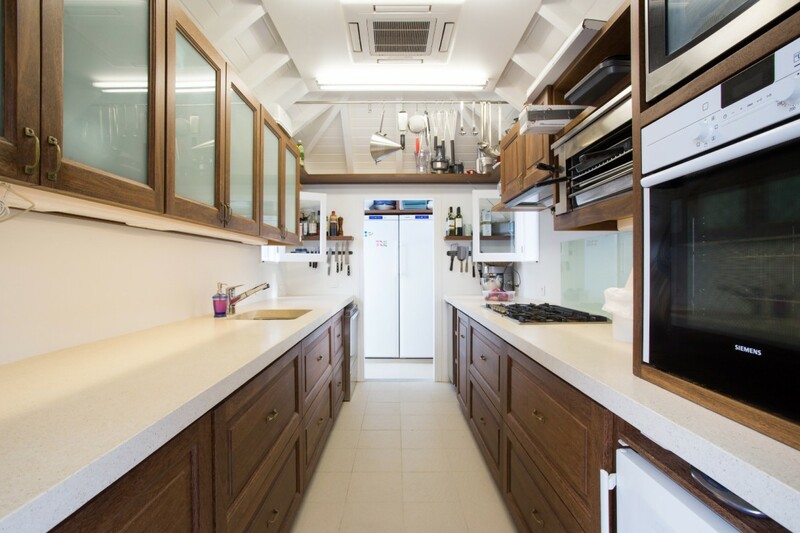 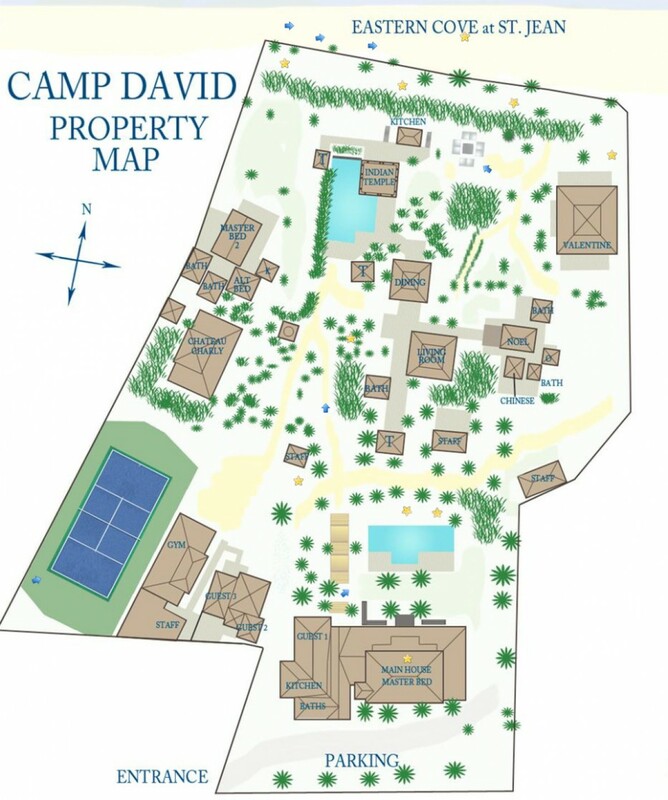 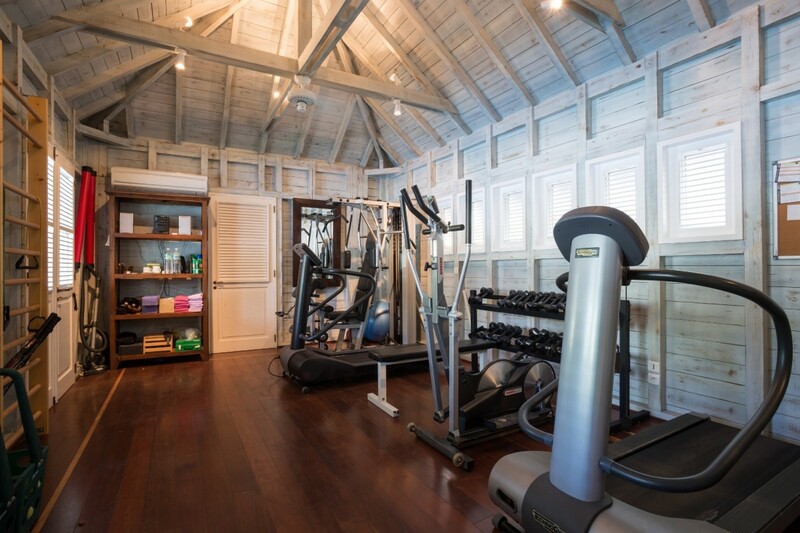 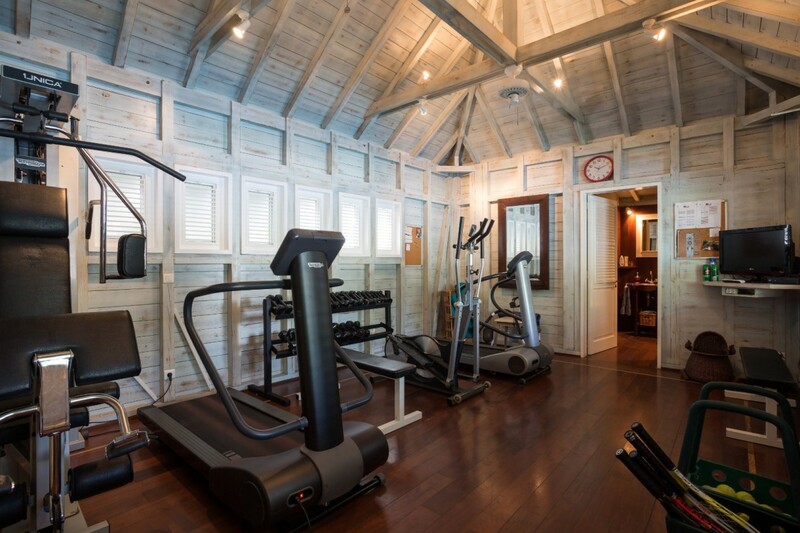 The shared living spaces include a large, open air living room pavilion, a gym, tennis courts, a main house with formal kitchen and dining area, staff quarters, and eleven separate structures each housing a premium, bedroom suite. 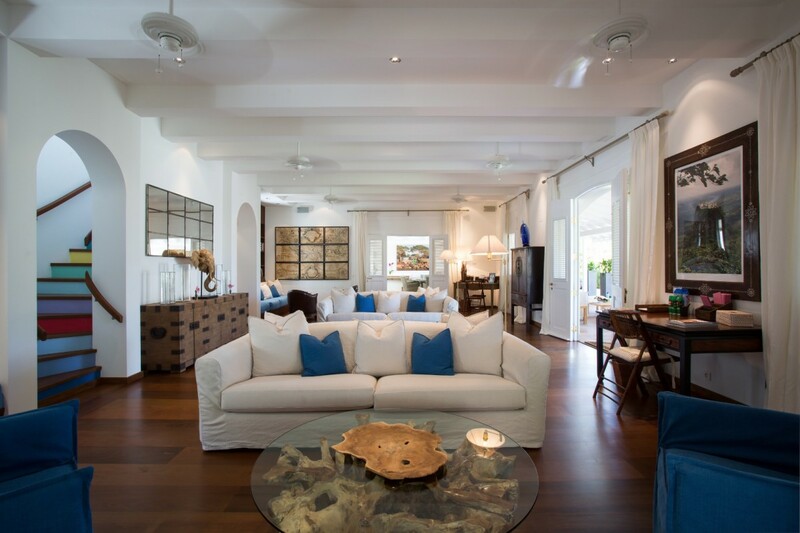 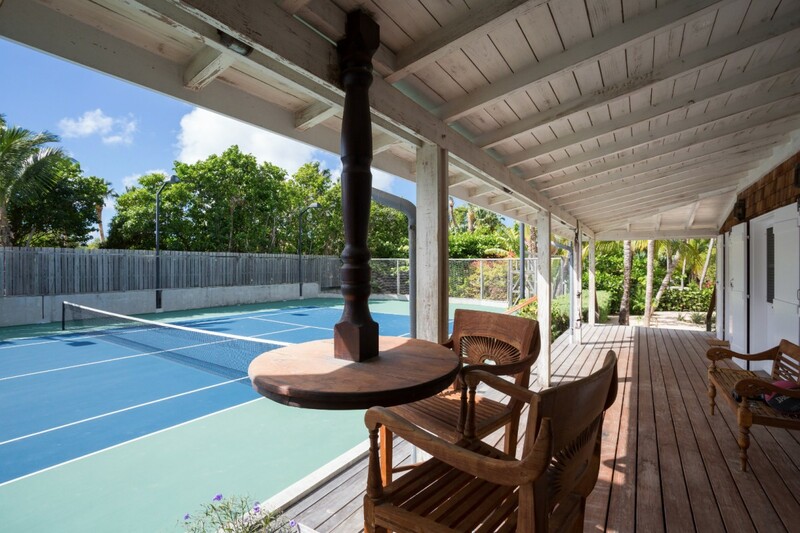 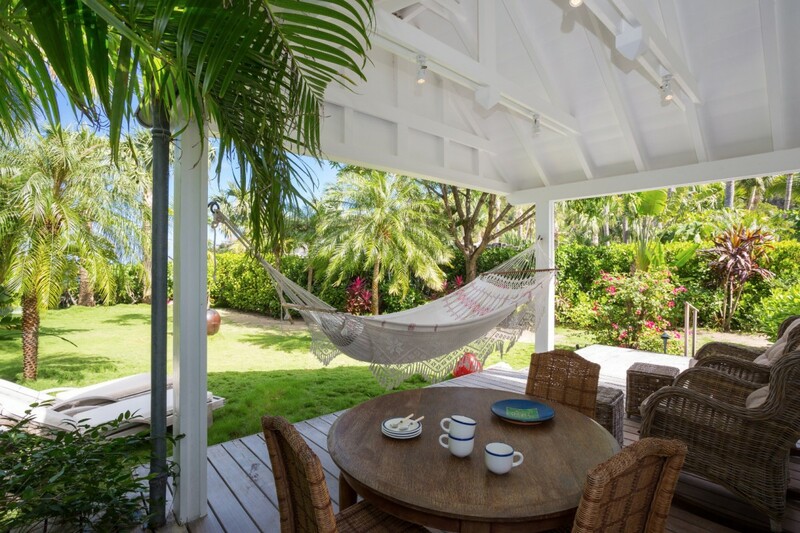 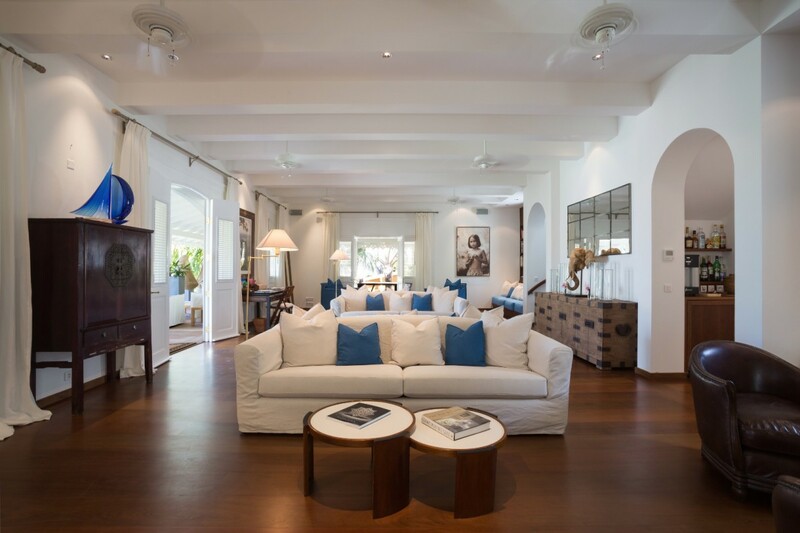 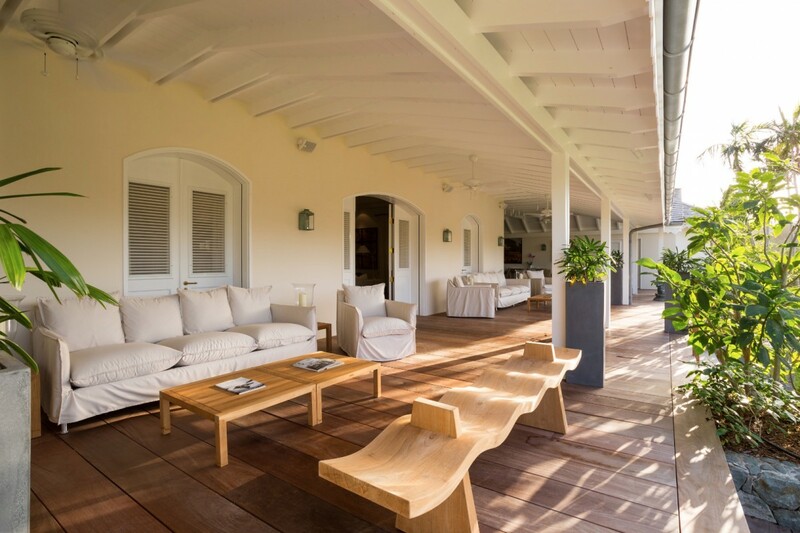 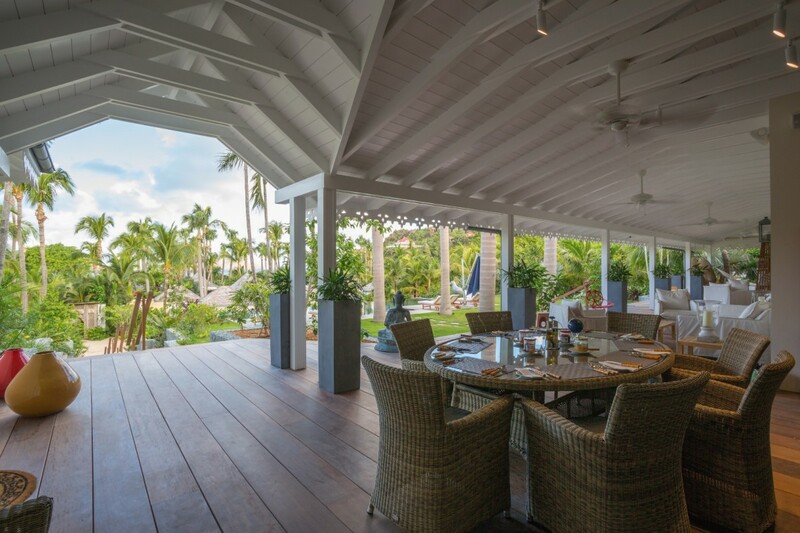 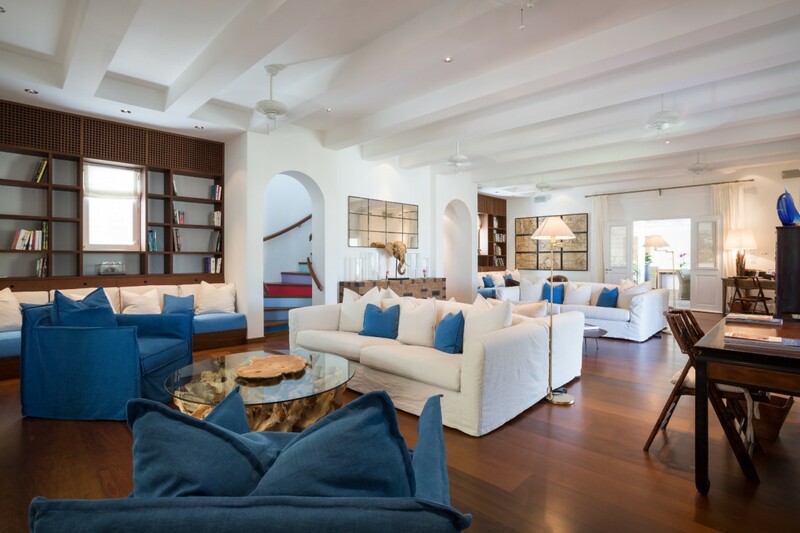 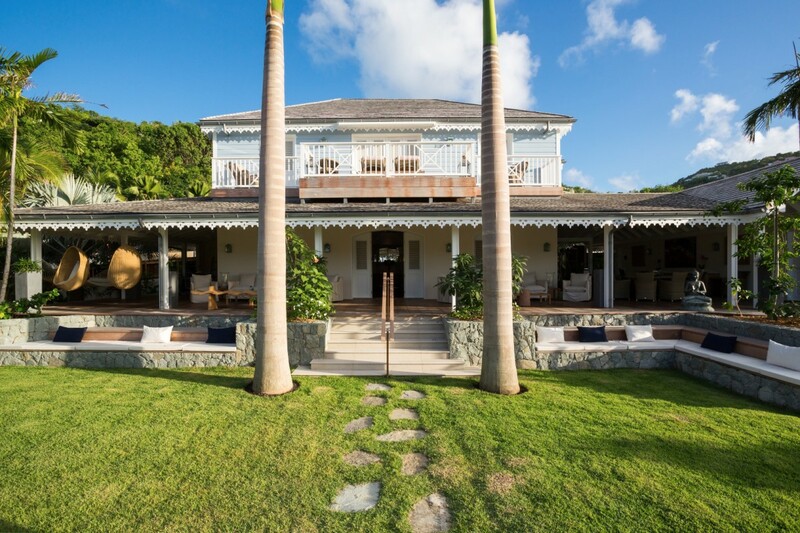 The overall architectural style of the property emphasizes island charm, and gingerbread moldings, stone terraces, and an astonishing array of indoor and outdoor living spaces make the entire compound one enormous place to savor the setting. 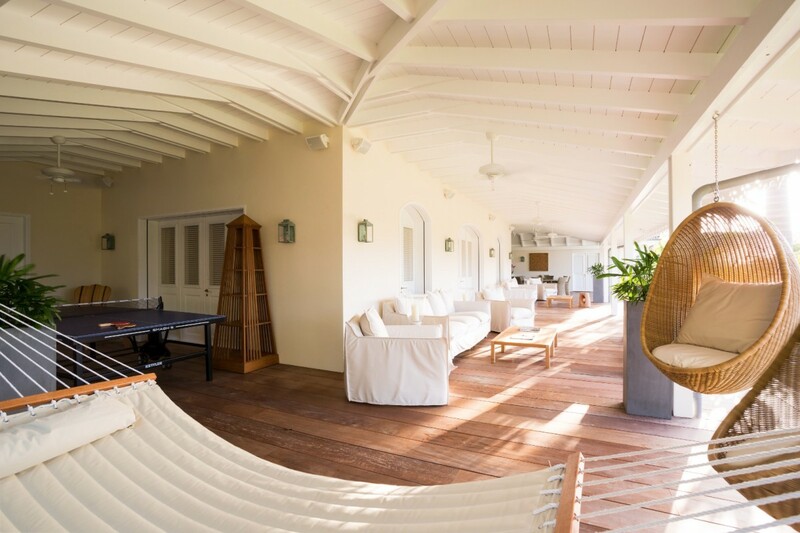 The main house features an irresistible wraparound porch with several sitting areas, and it also has a fantastic great room easily able to host family gatherings. 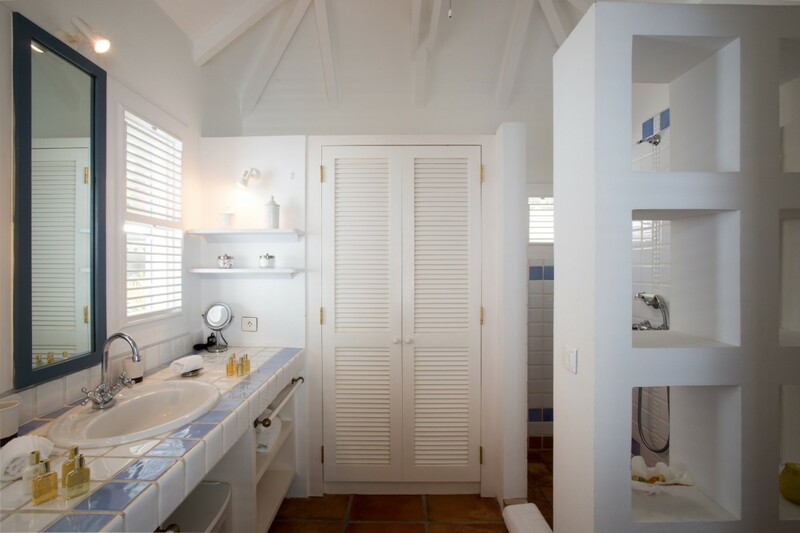 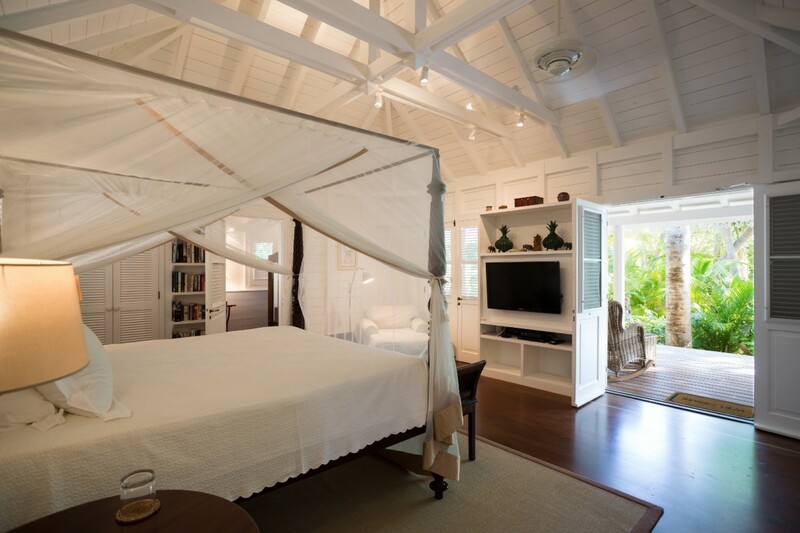 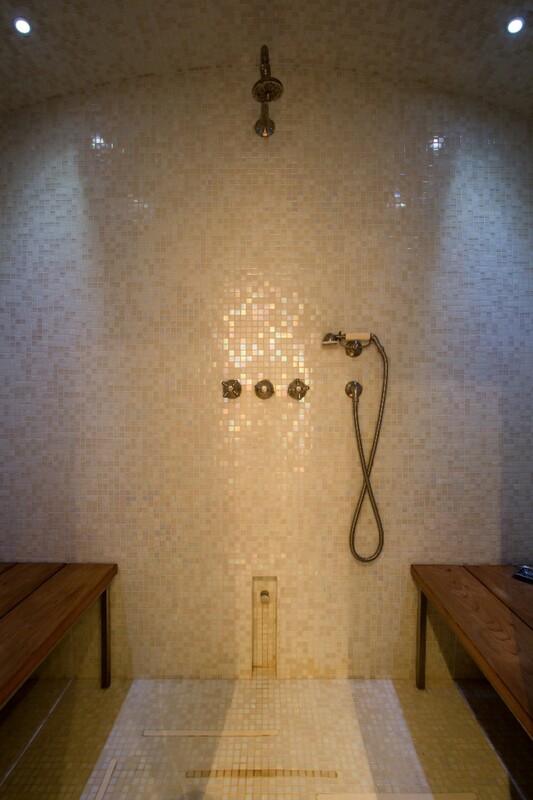 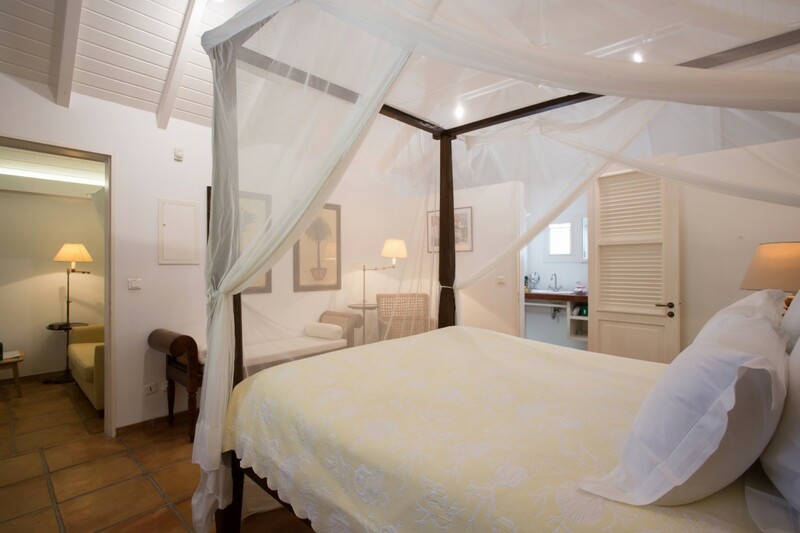 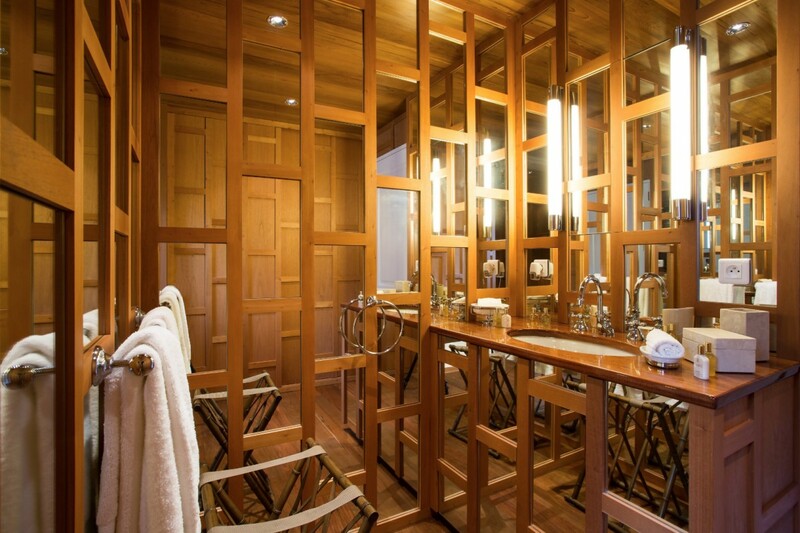 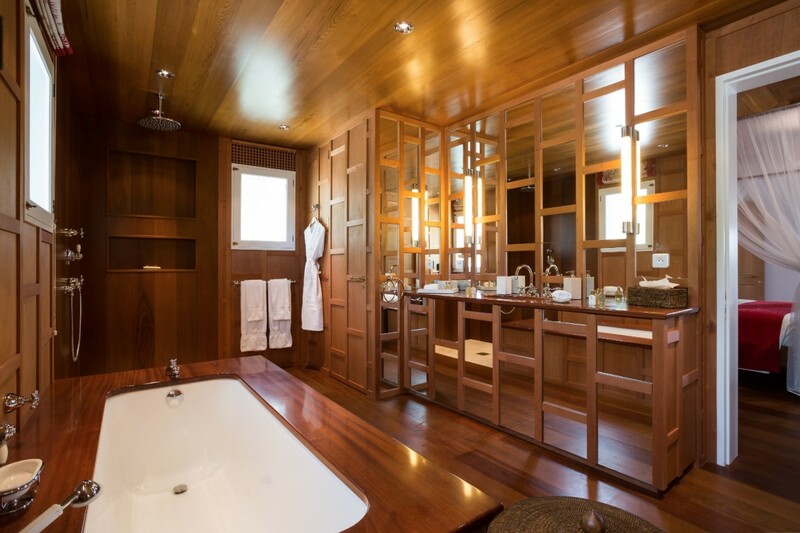 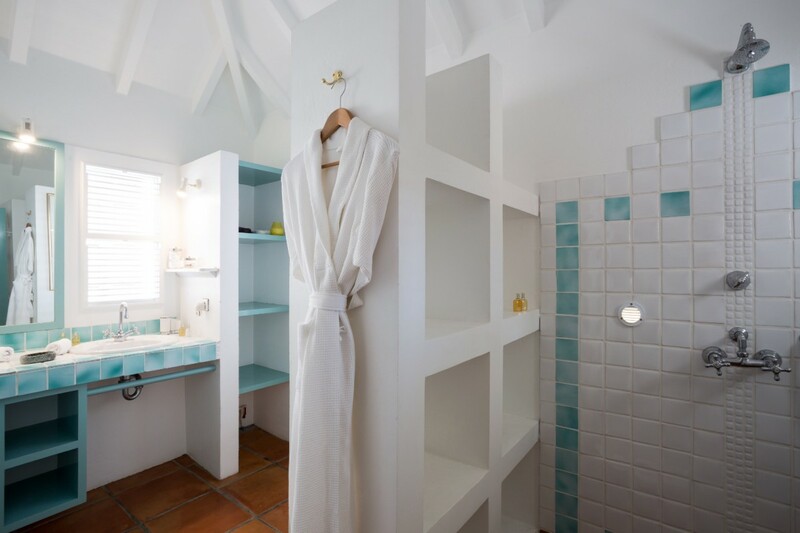 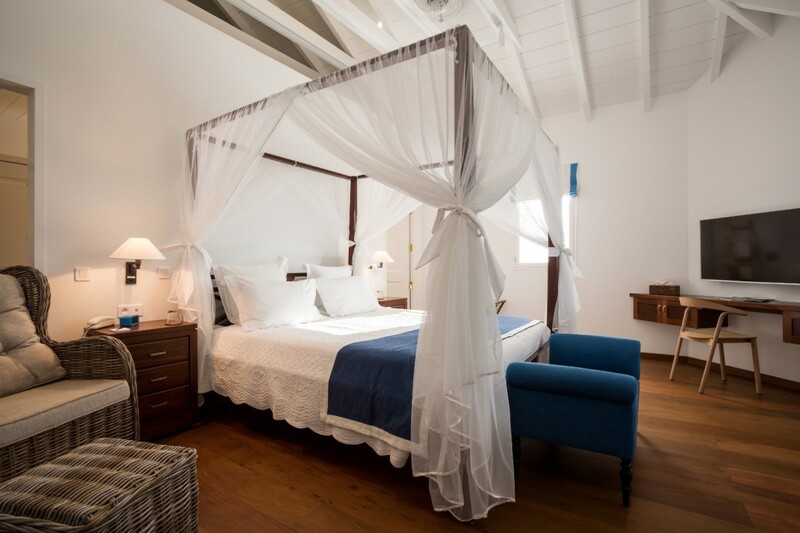 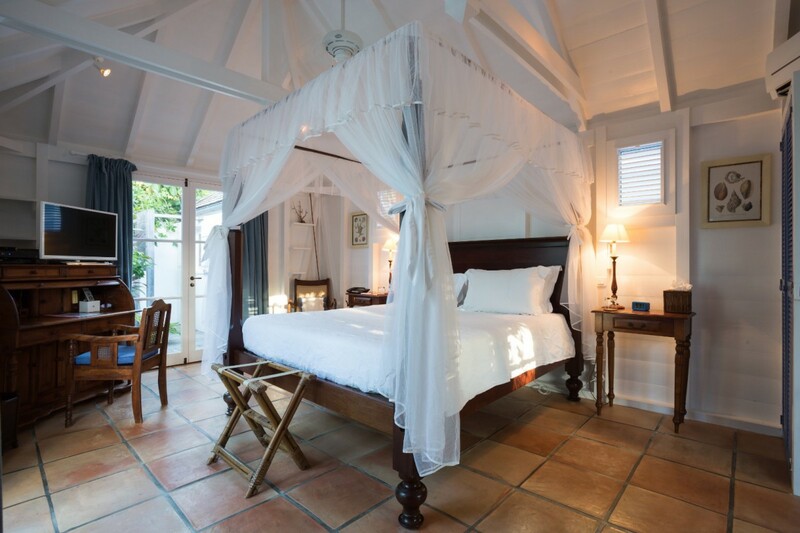 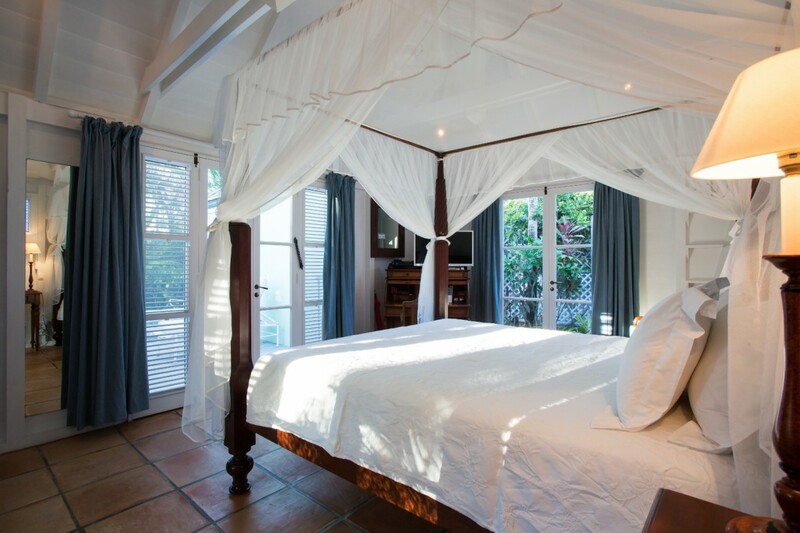 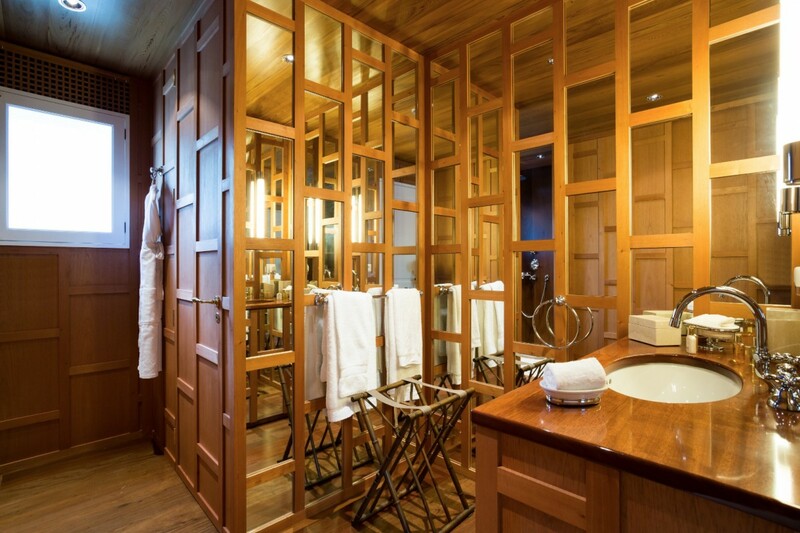 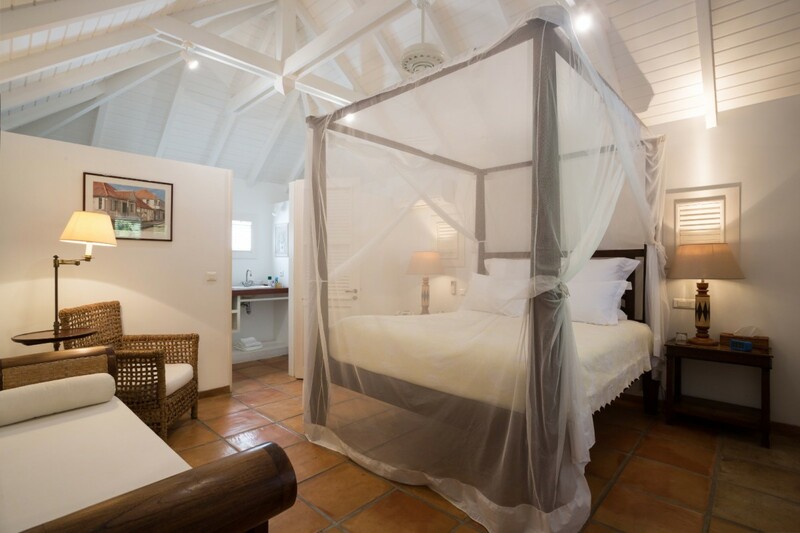 The main house has two bedroom suites, one a master suite, but both with king beds and private baths. 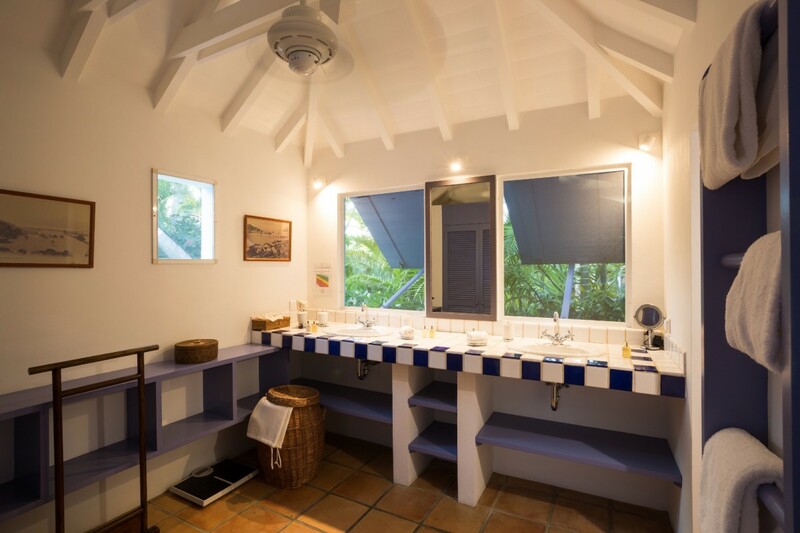 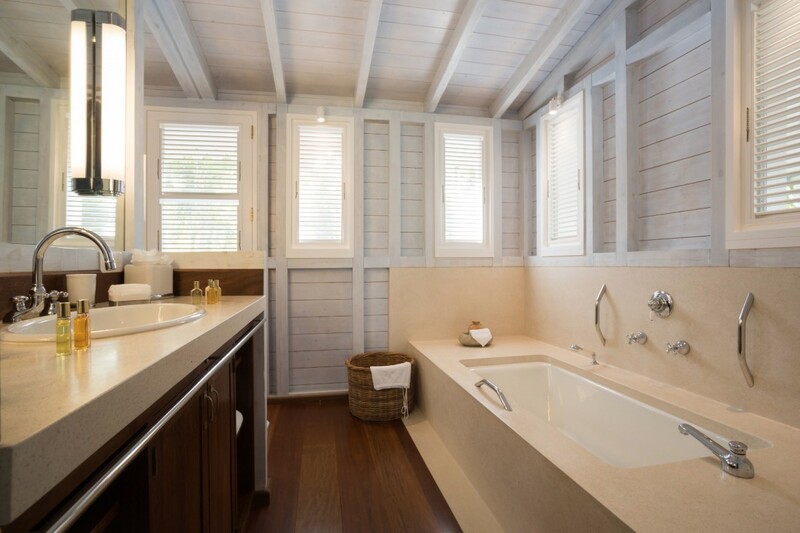 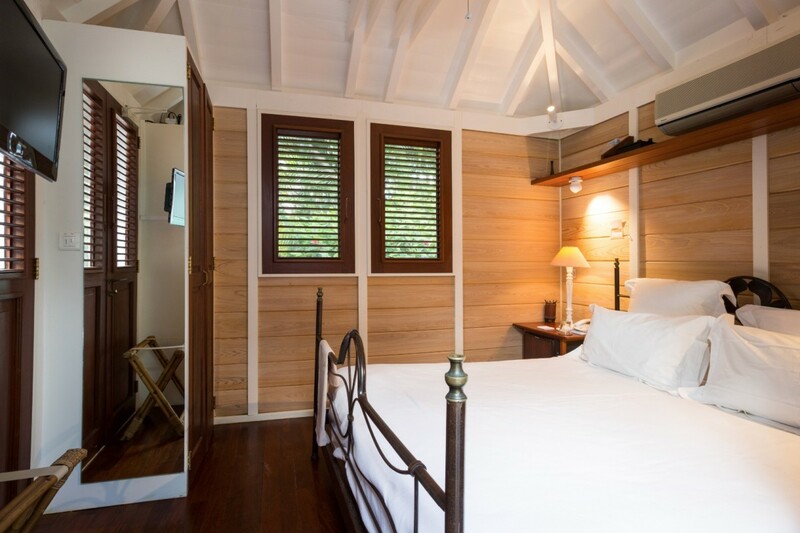 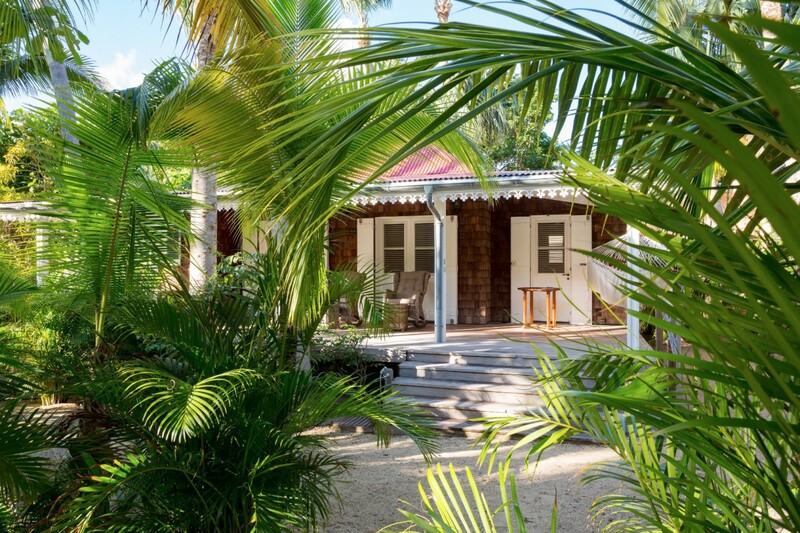 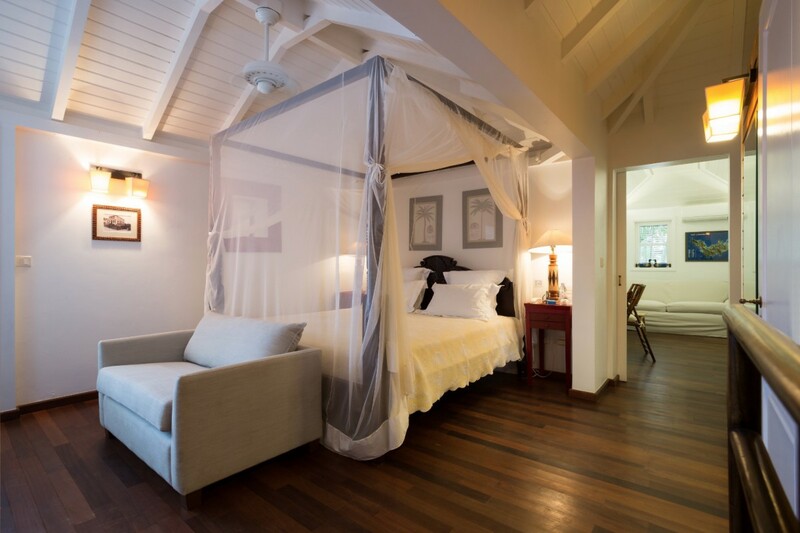 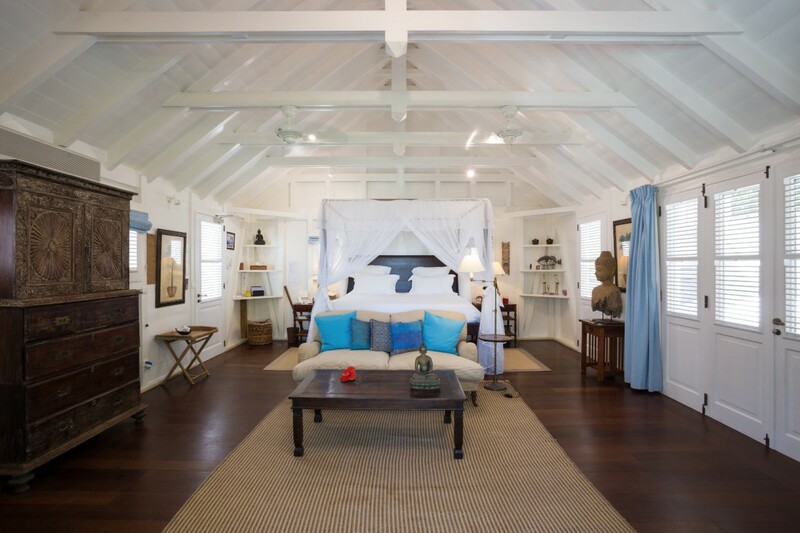 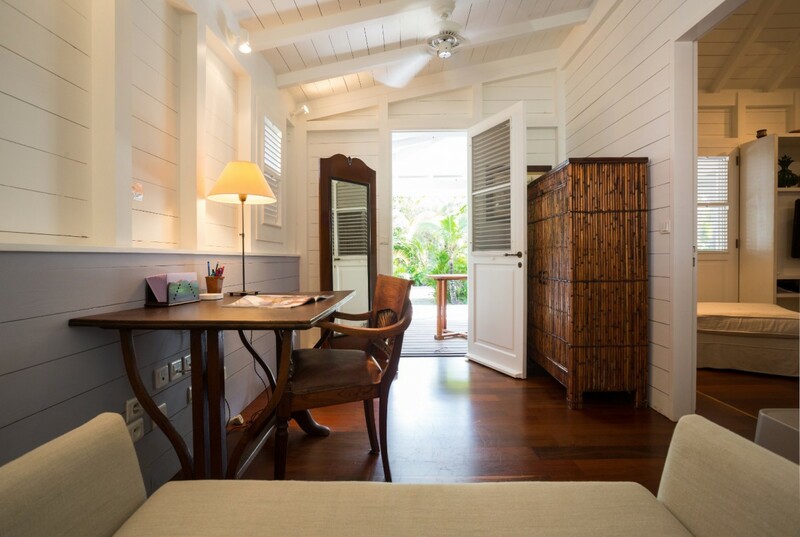 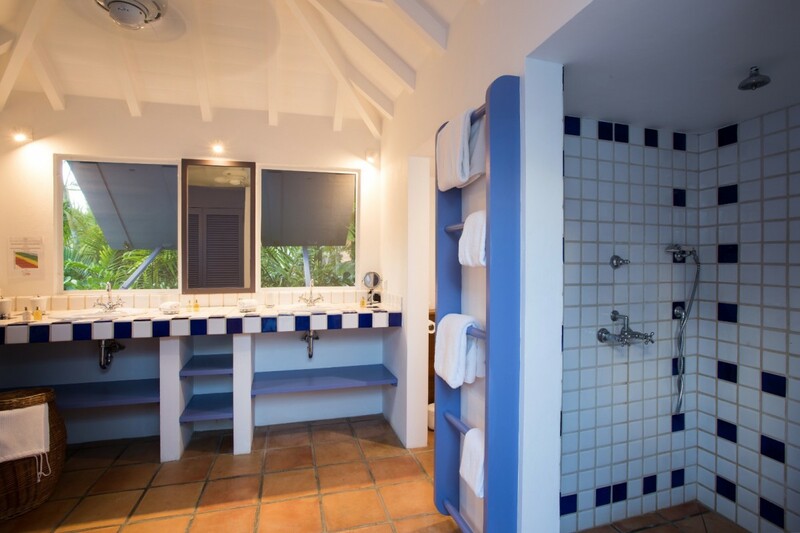 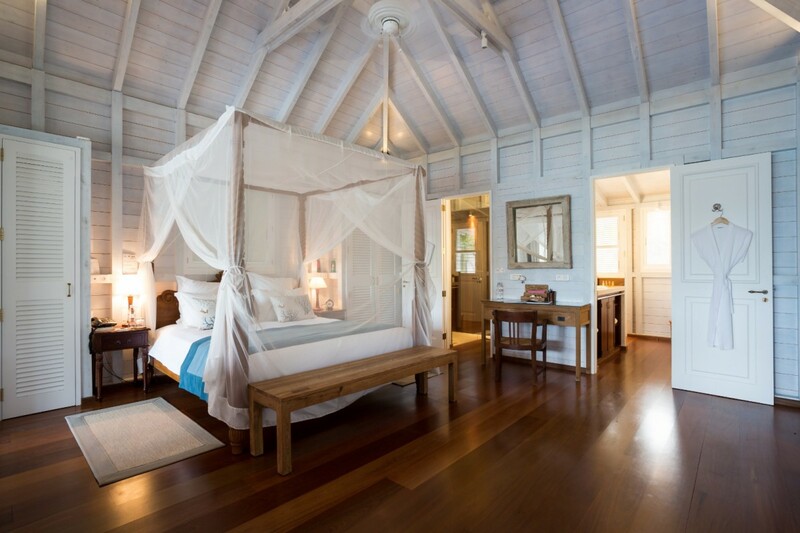 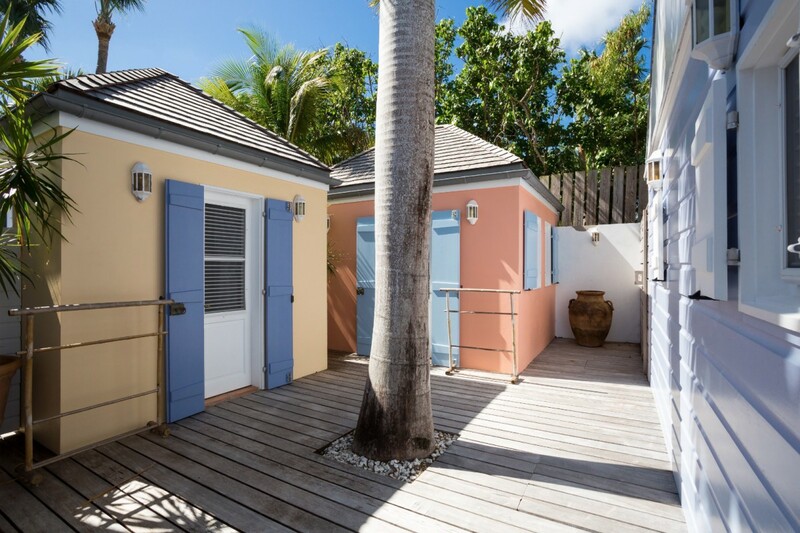 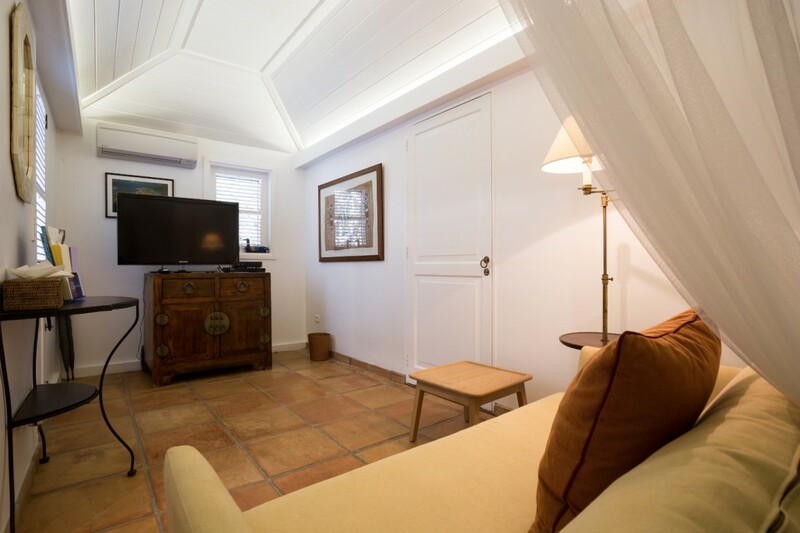 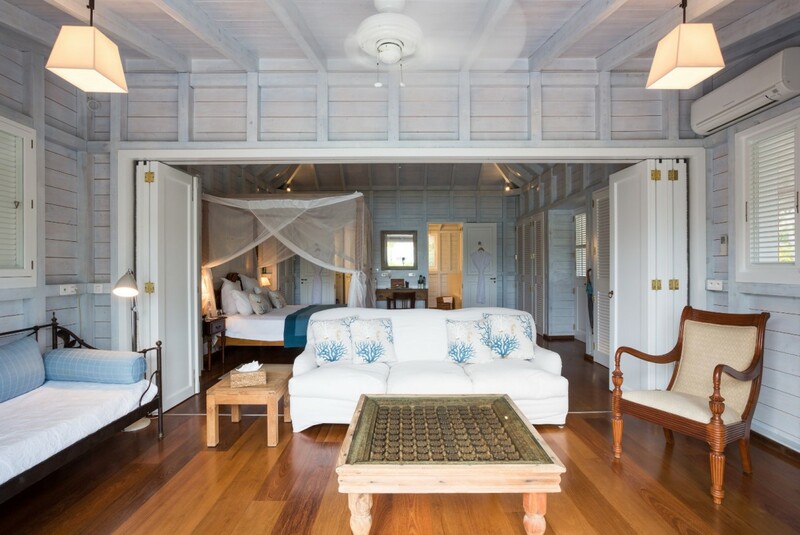 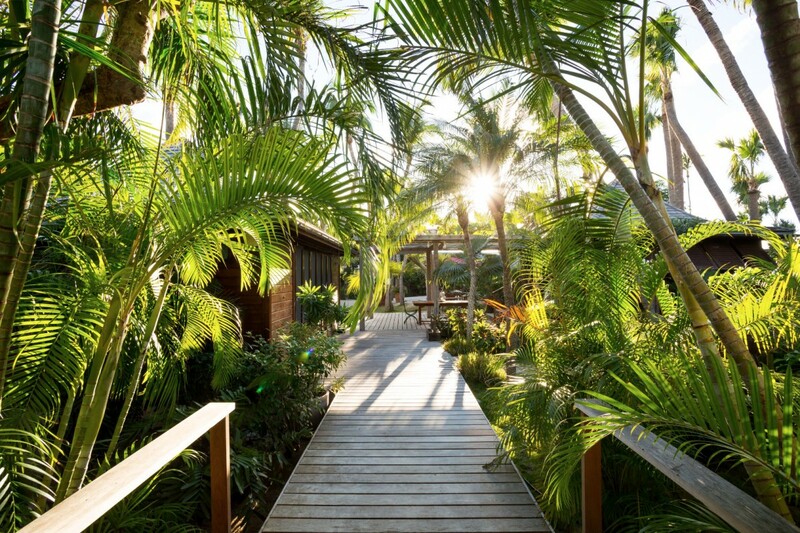 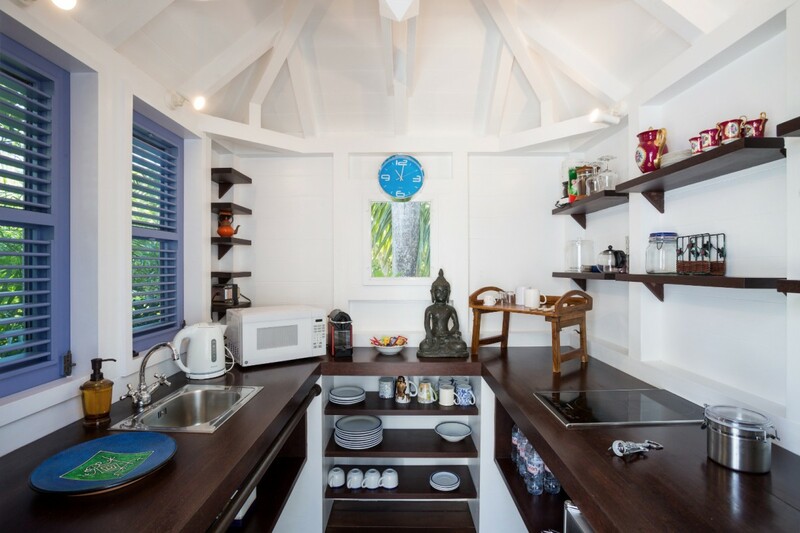 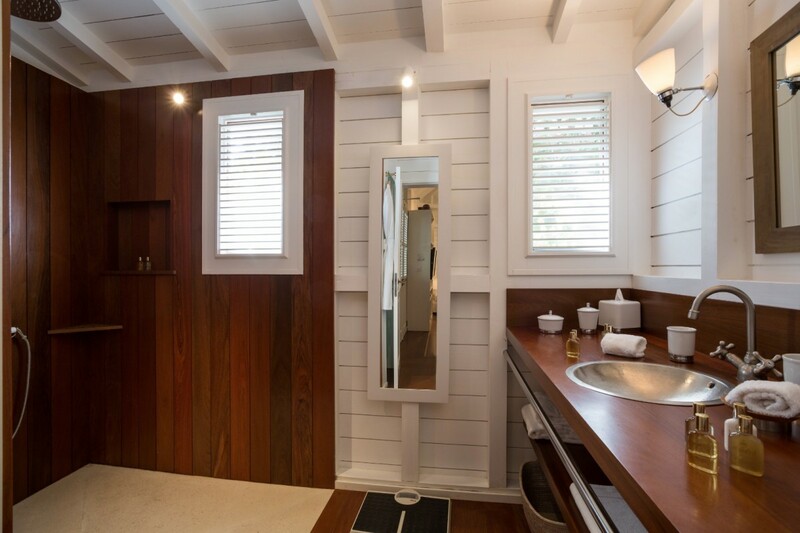 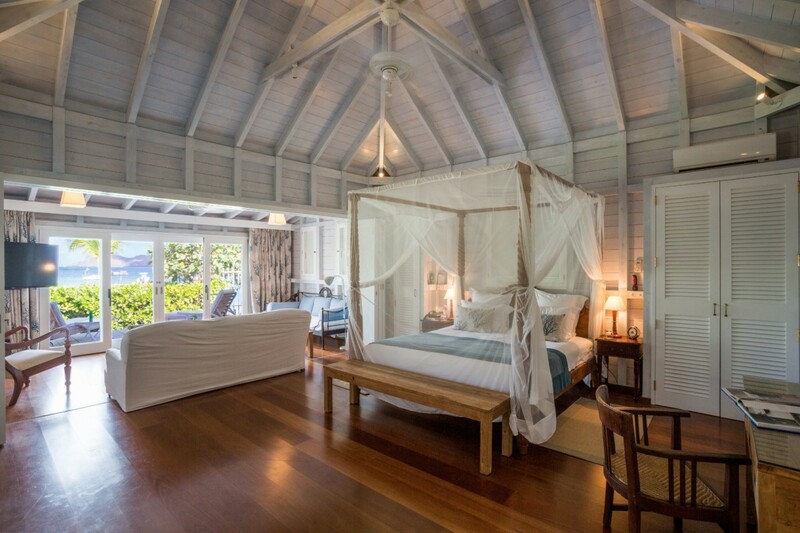 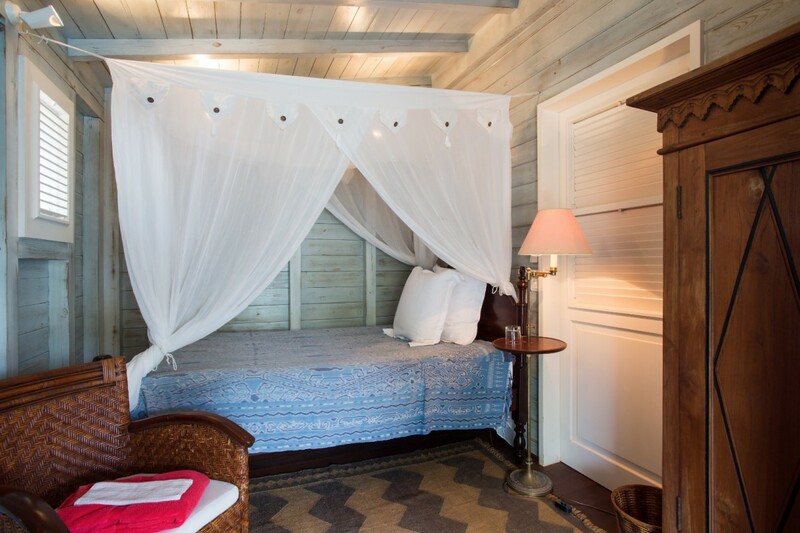 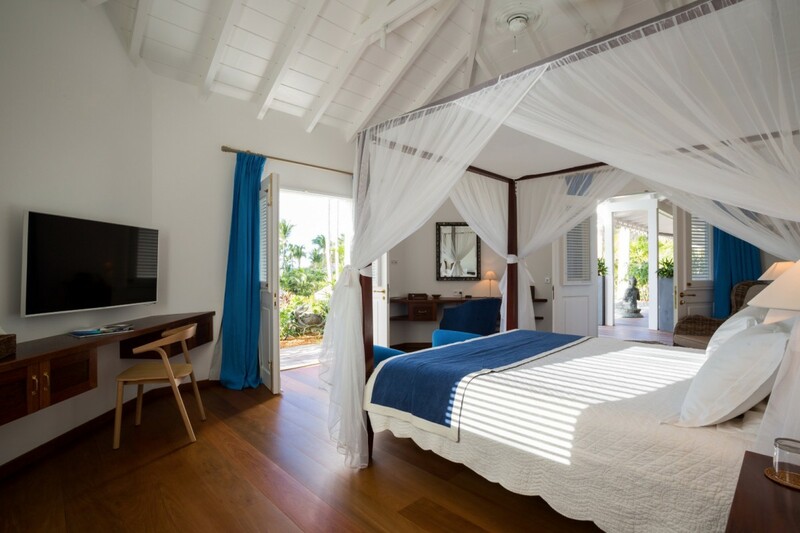 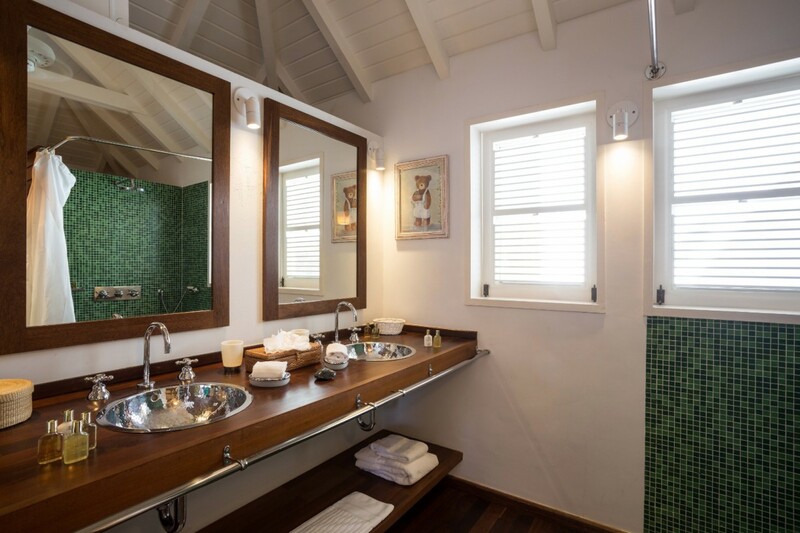 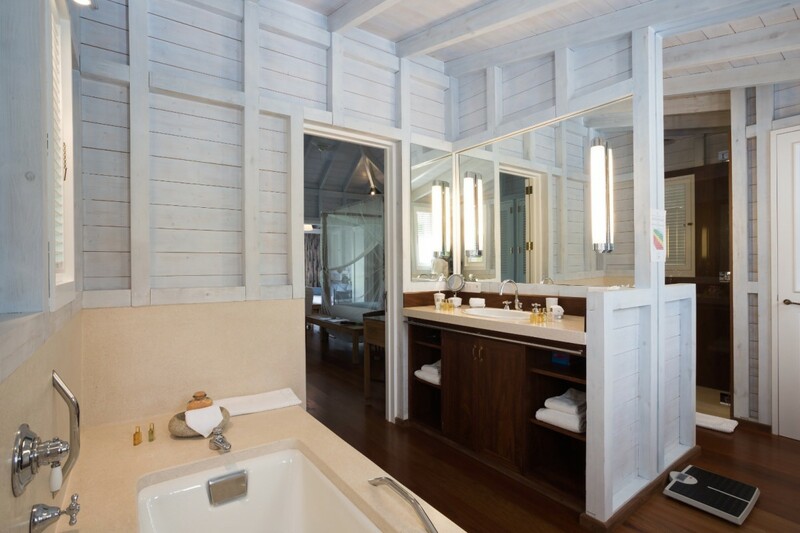 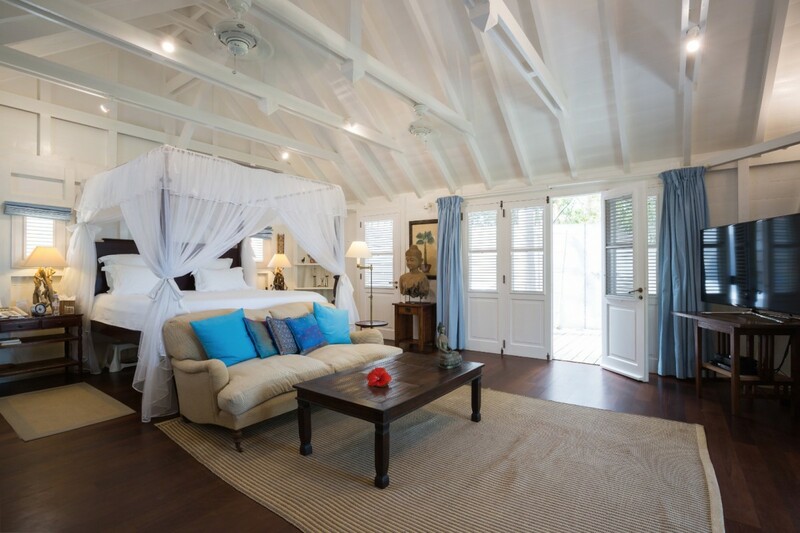 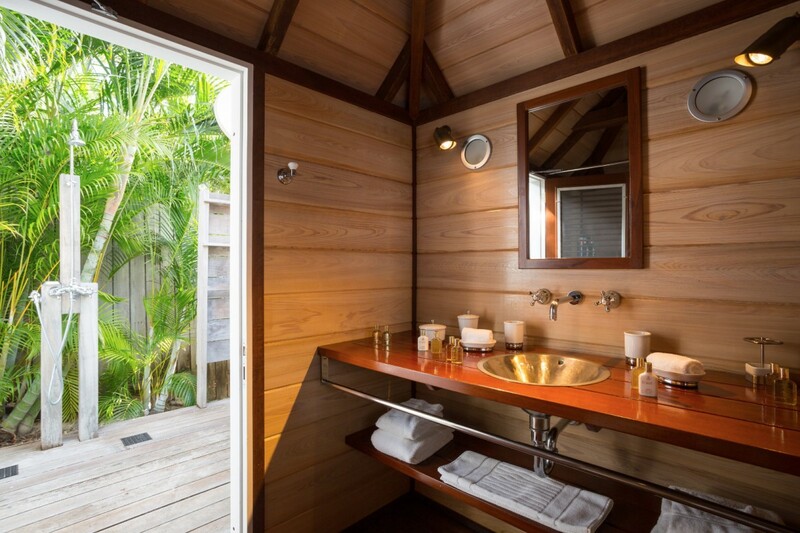 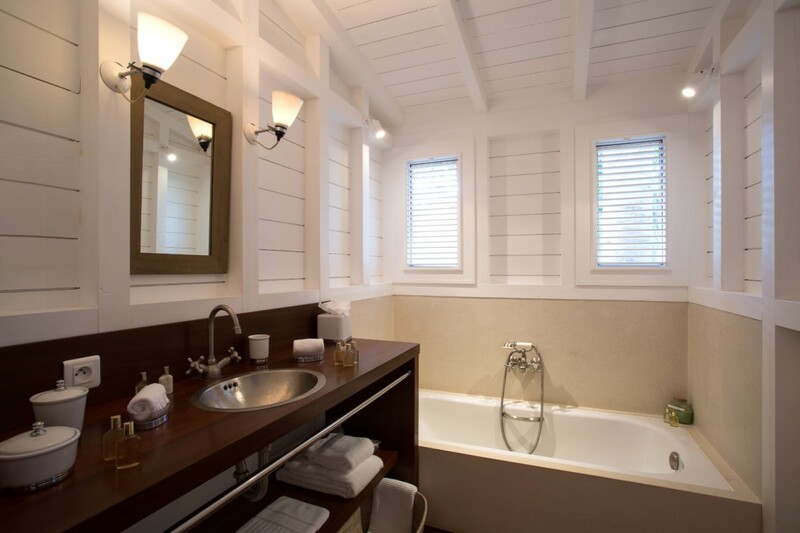 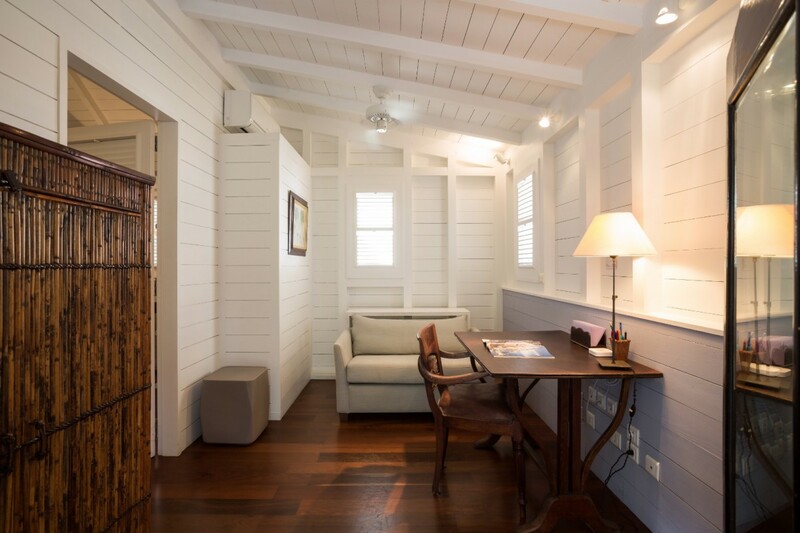 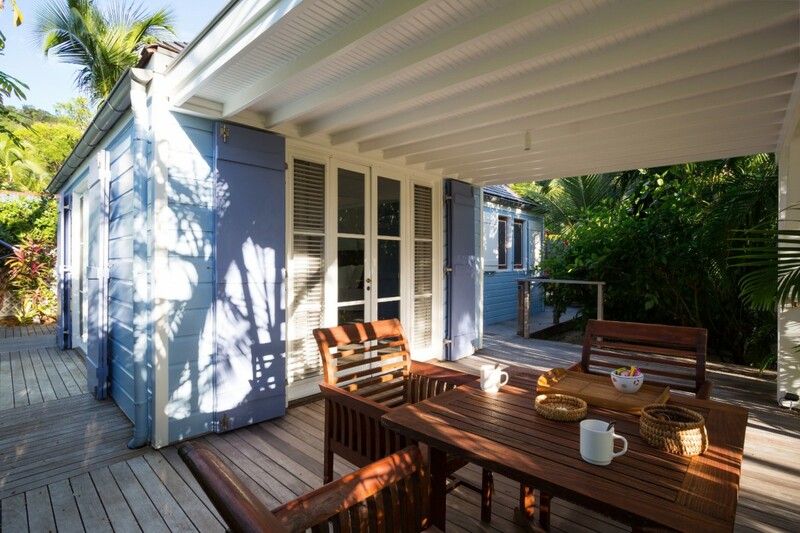 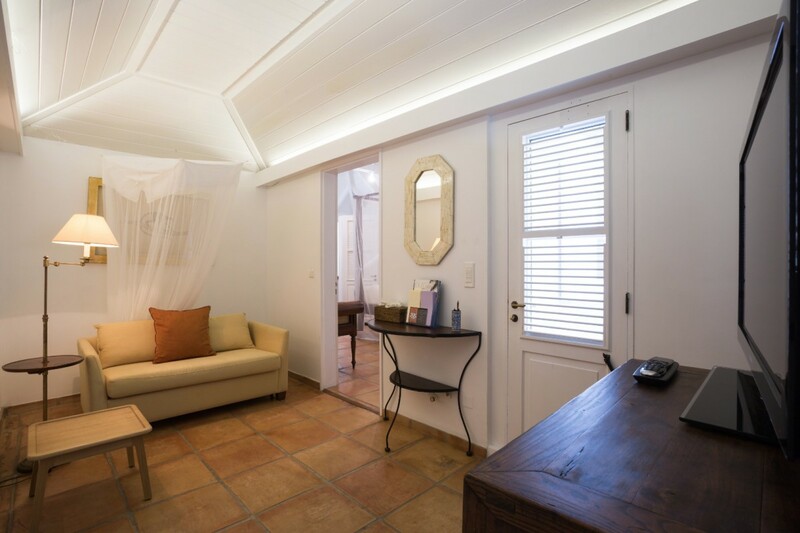 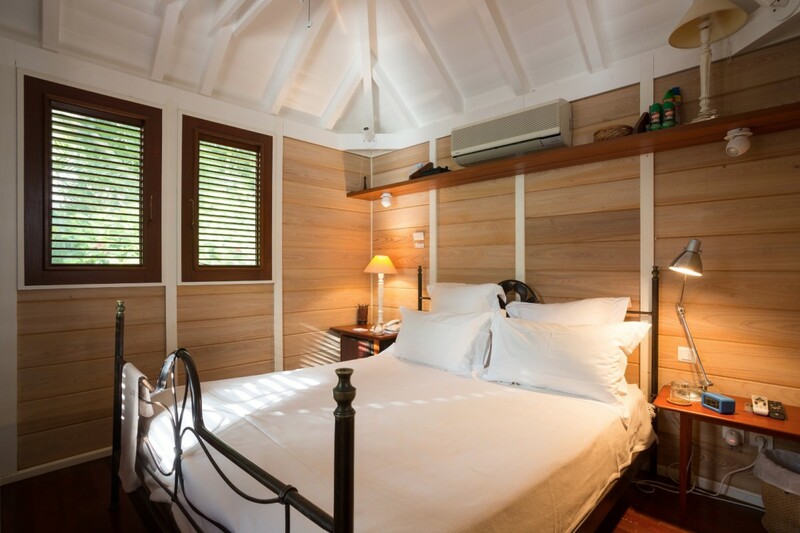 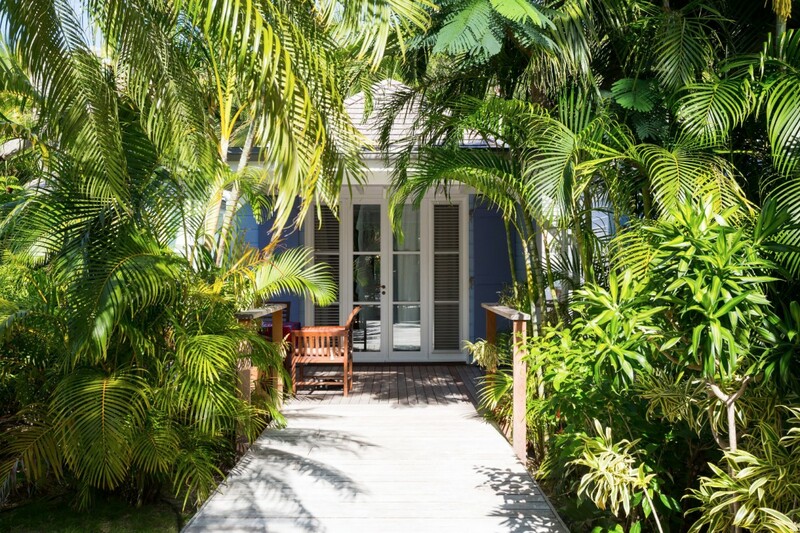 The remaining suites are in smaller bungalows or chateaus and include four-poster king beds, private terraces, large private baths, and entertainment systems. 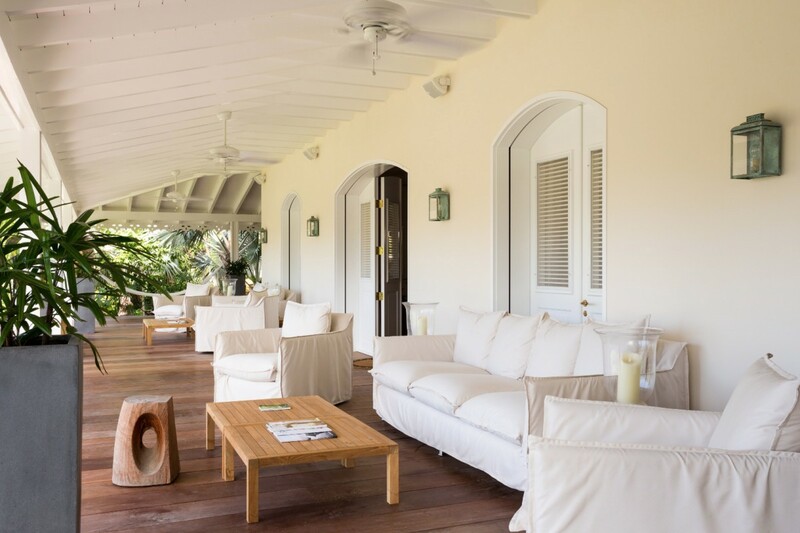 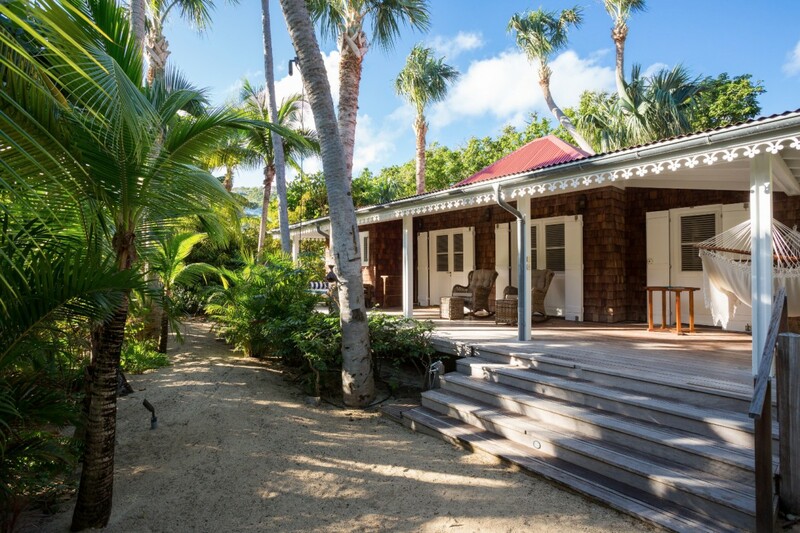 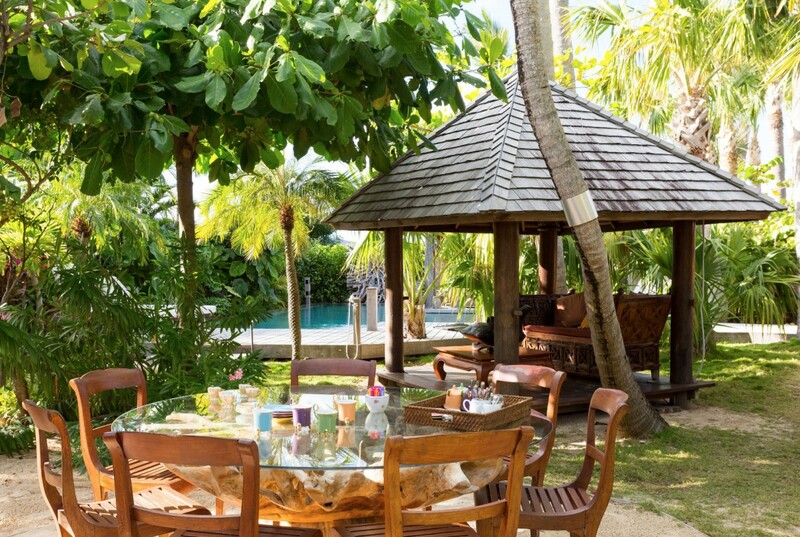 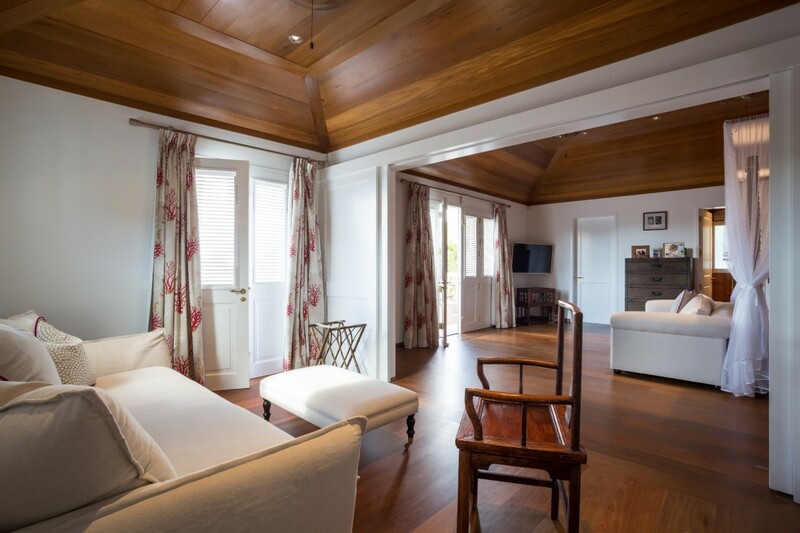 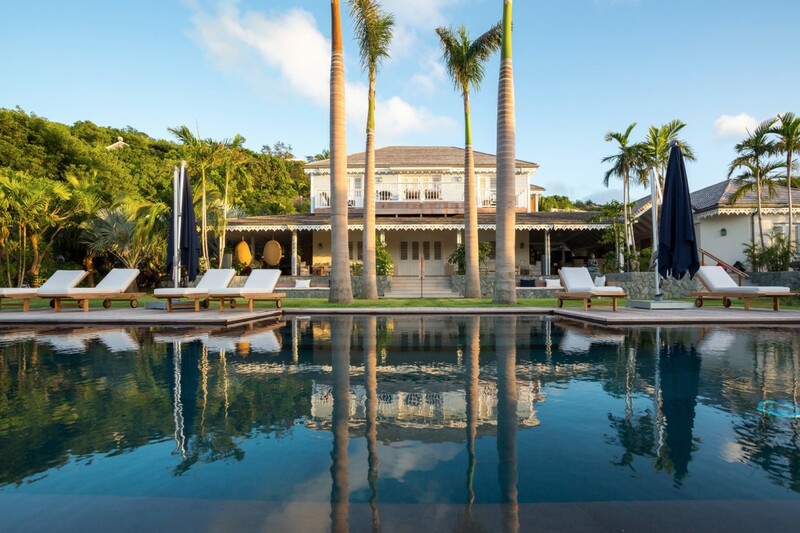 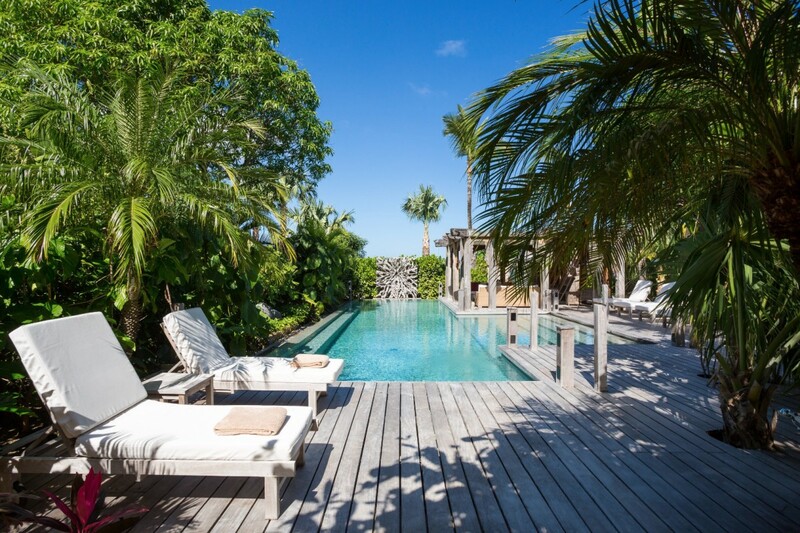 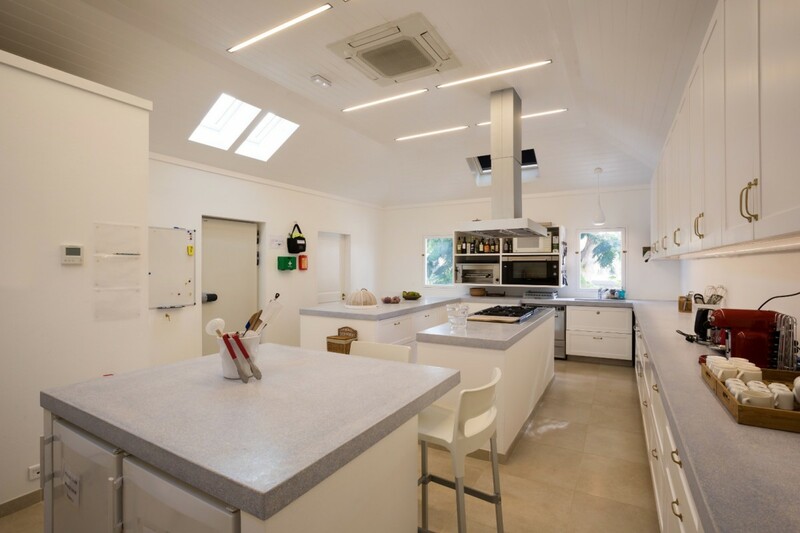 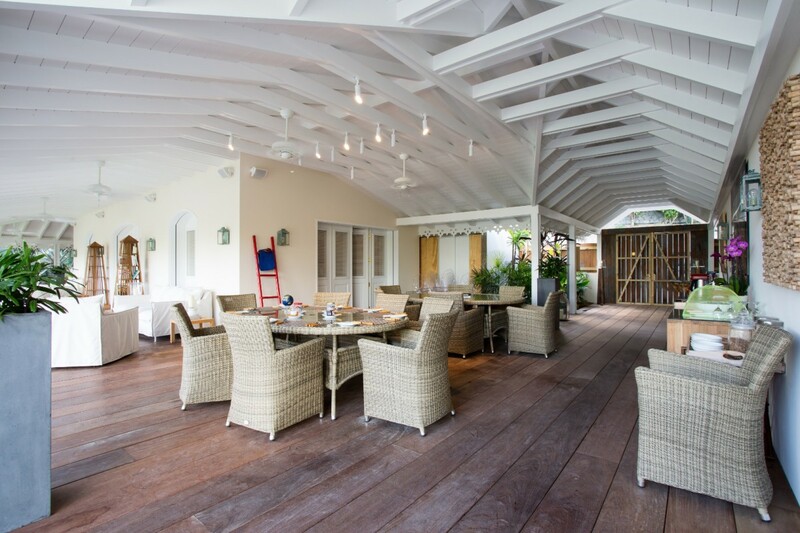 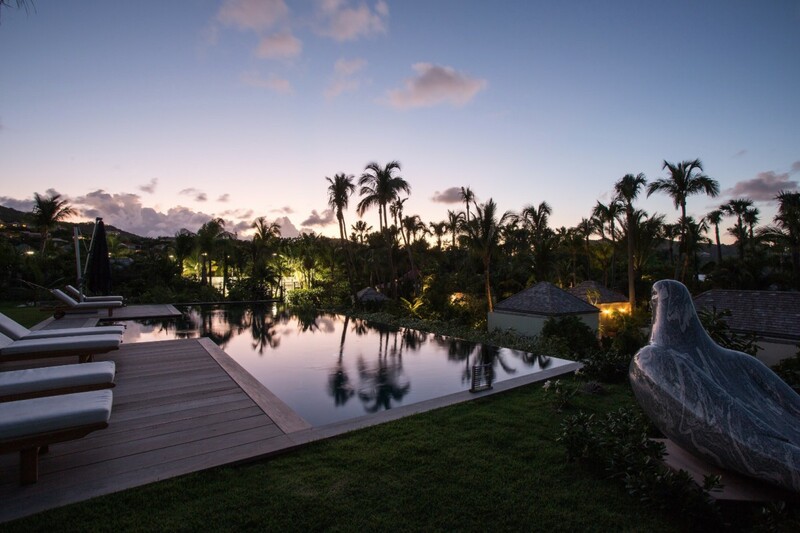 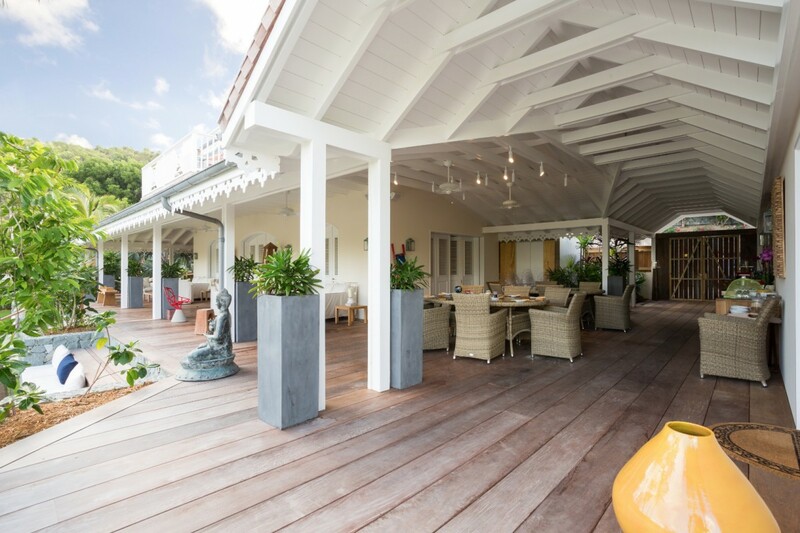 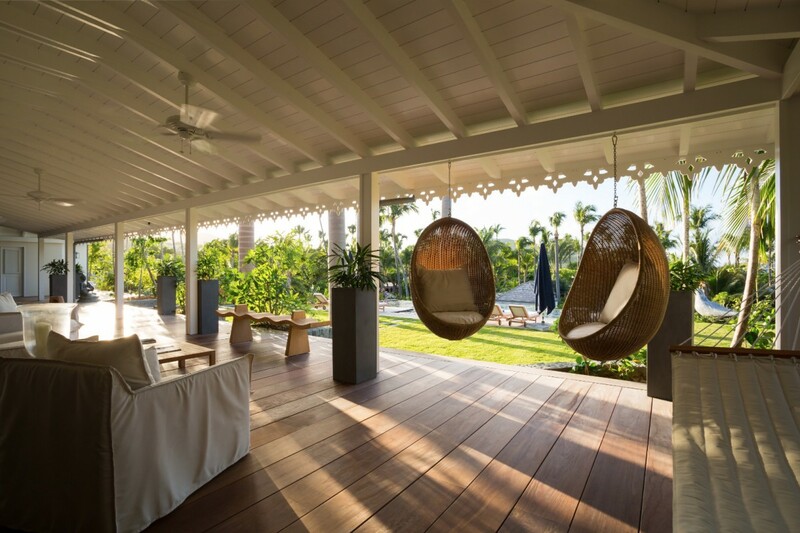 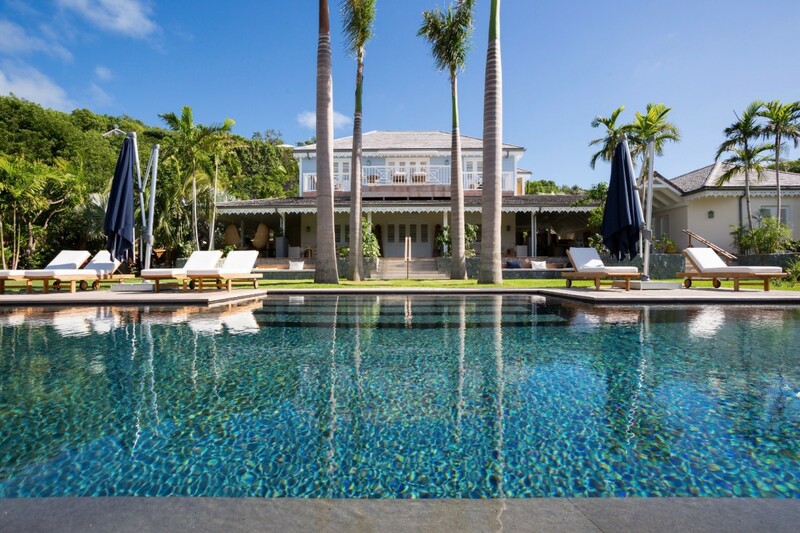 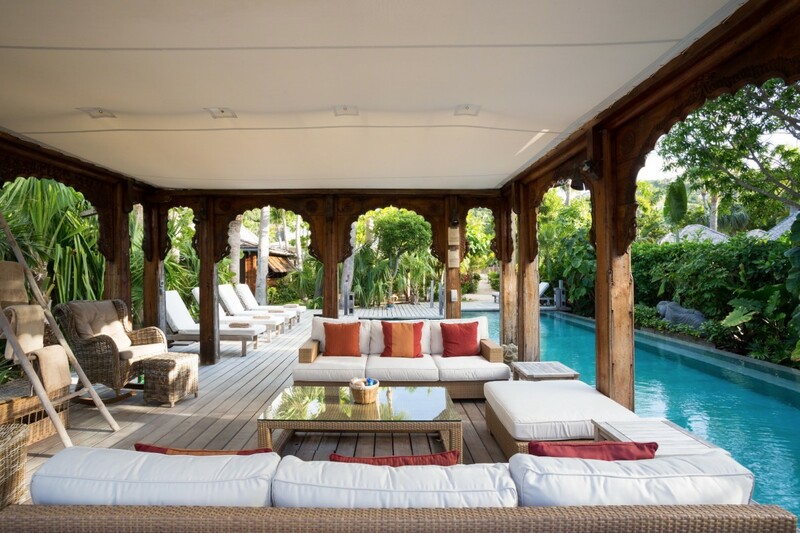 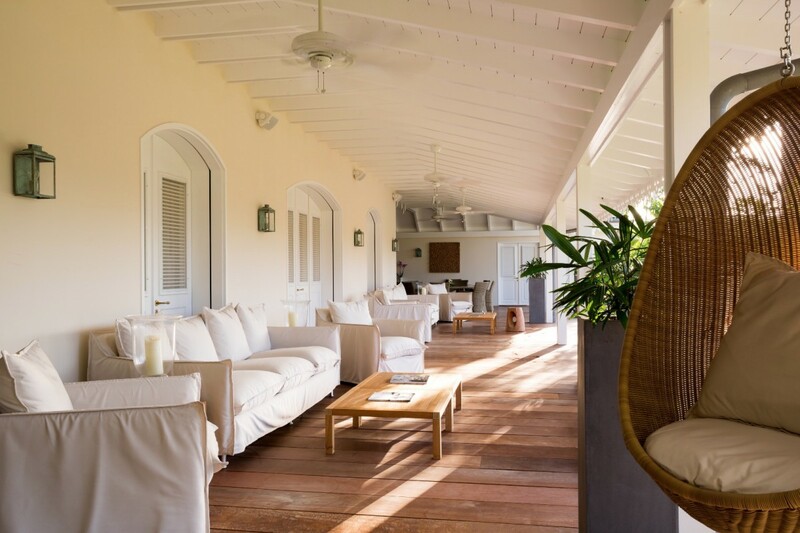 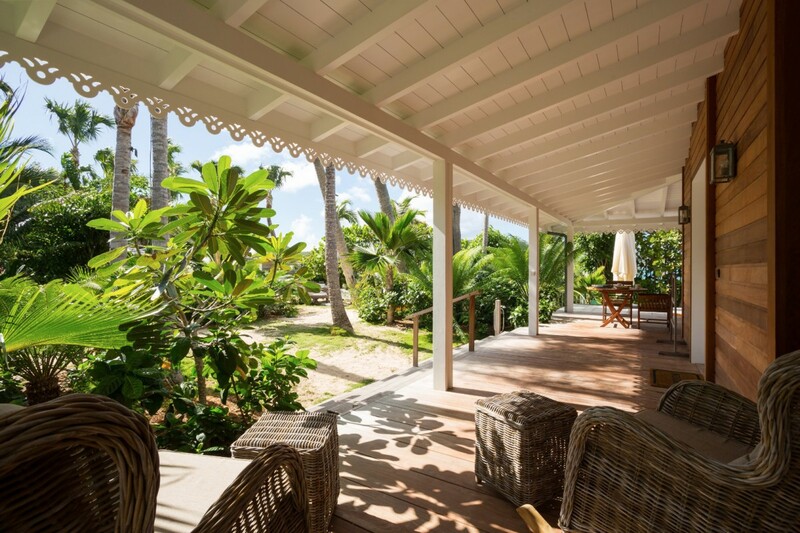 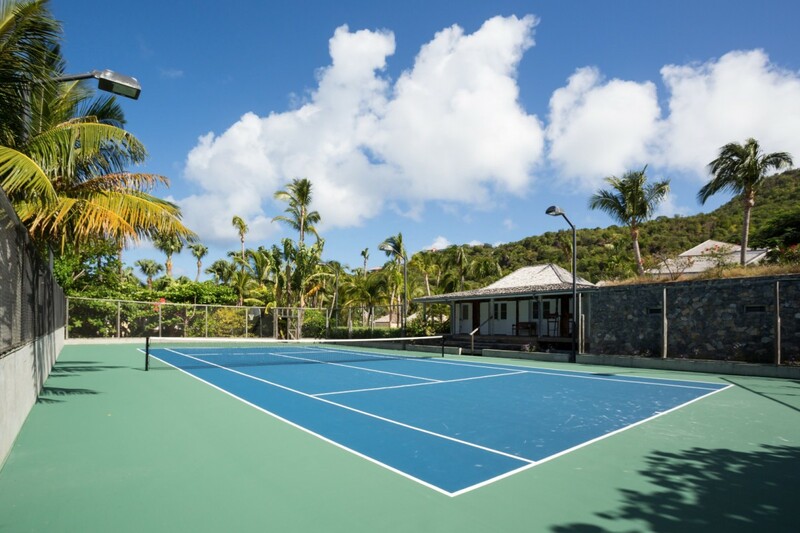 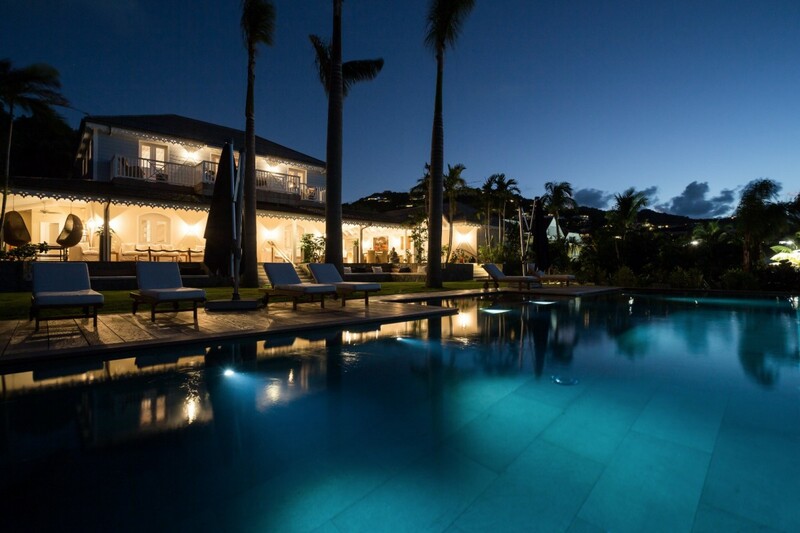 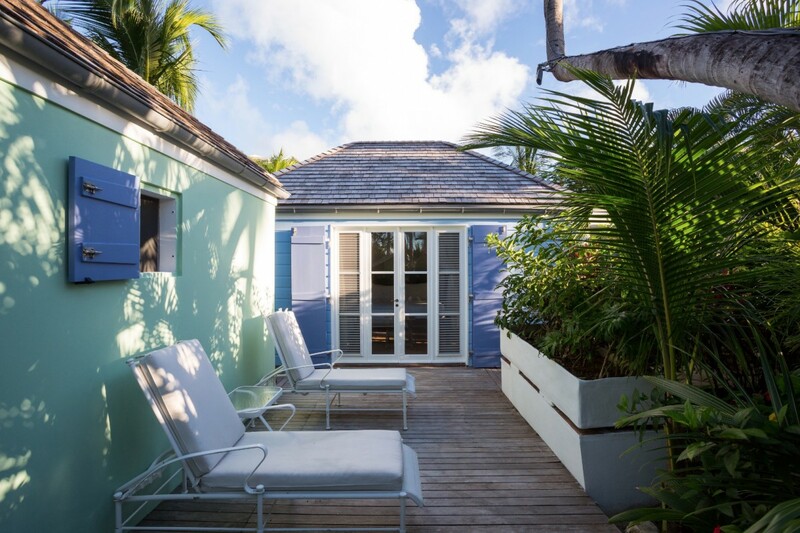 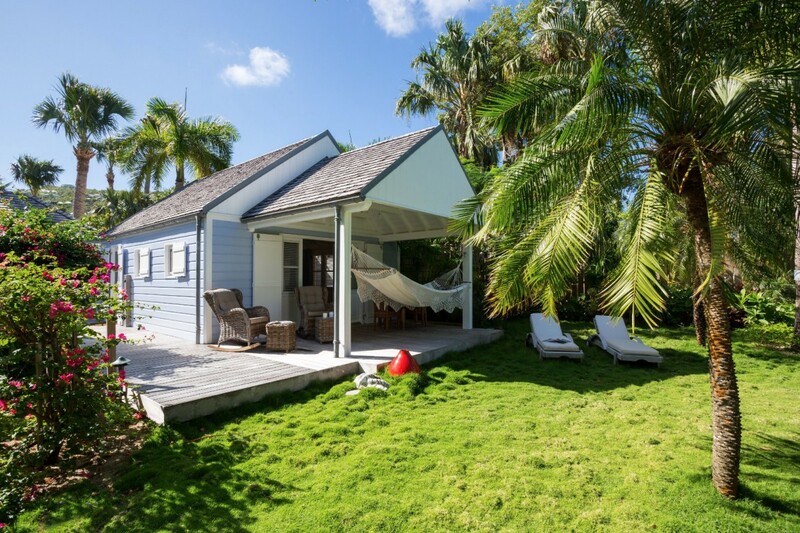 Villa Manoir de St Jean is an amazing find ideal for unforgettable vacations and events, and it is a must for your next visit to the island. 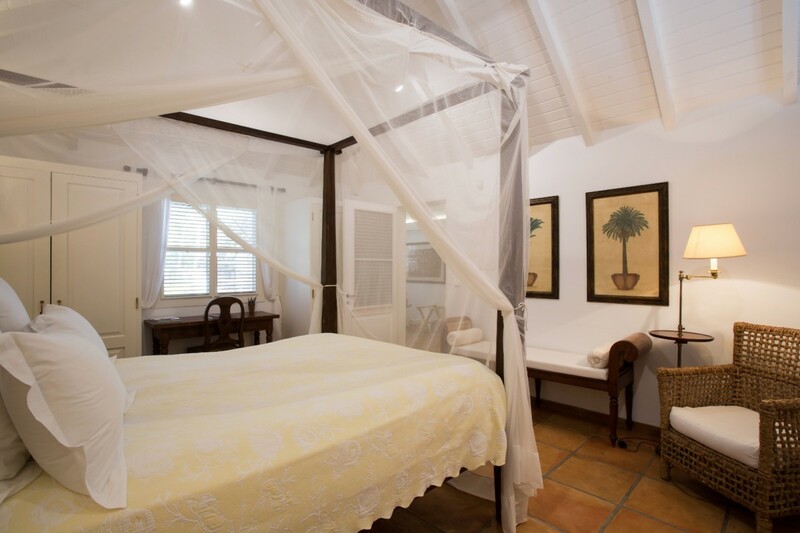 Bedroom 1: Ground floor bedroom with a four-poster king-size bed, A/C, ceiling fan, TV, access to the terrace and gardens and en-suite bathroom with shower, double vanity and WC. 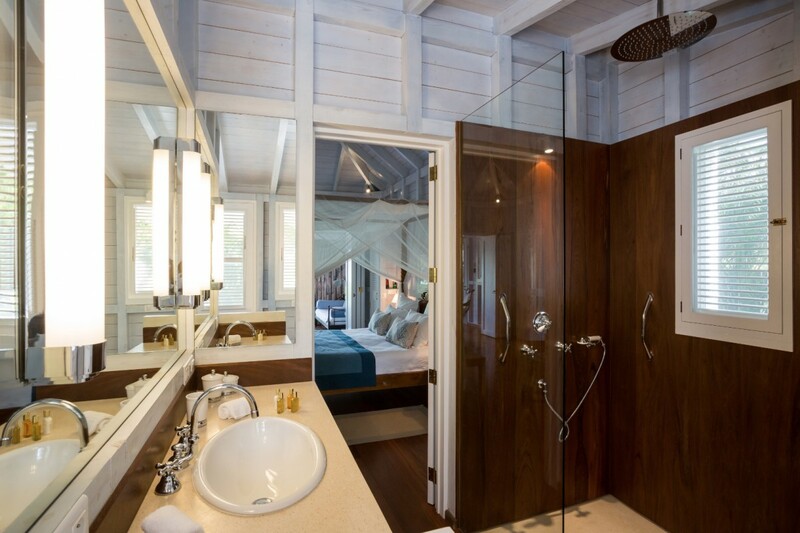 2 guests maximum. 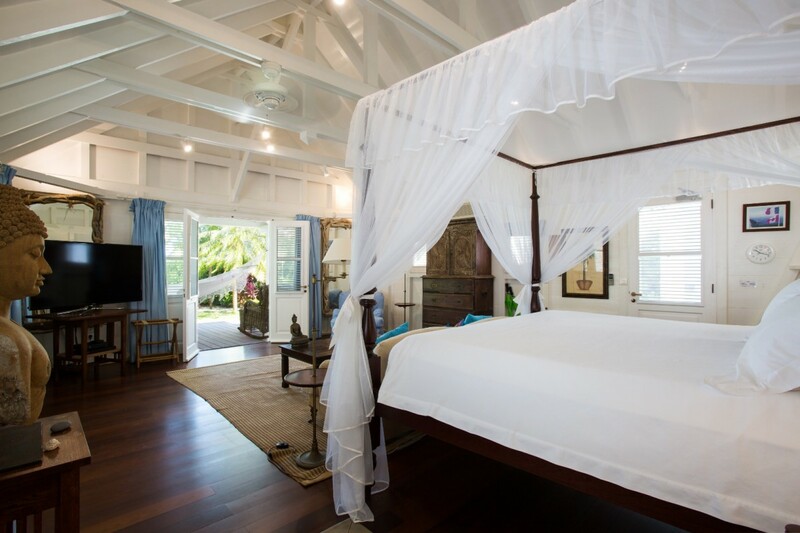 Bedroom 2: First floor Master bedroom with a four-poster king-size bed, A/C, ceiling fan, TV, lounge area, private terrace, dressing room and en-suite bathroom with bathtub, shower, double vanity and separate WC. 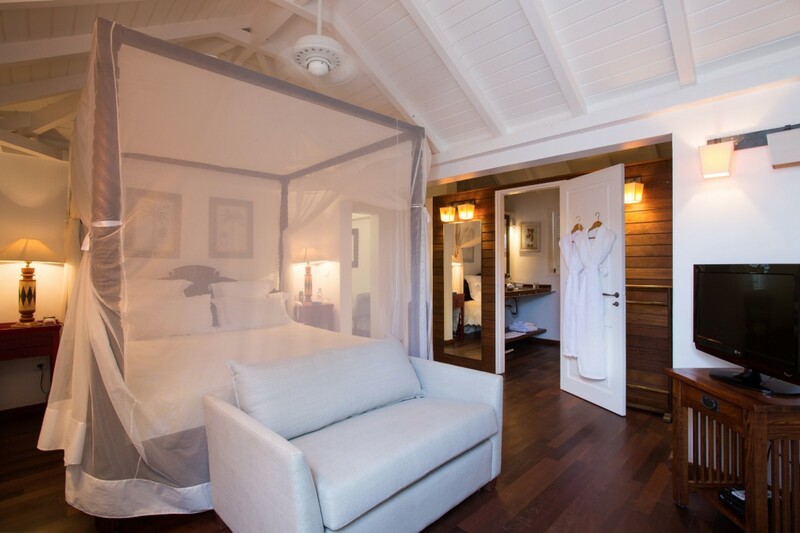 2 guests maximum. 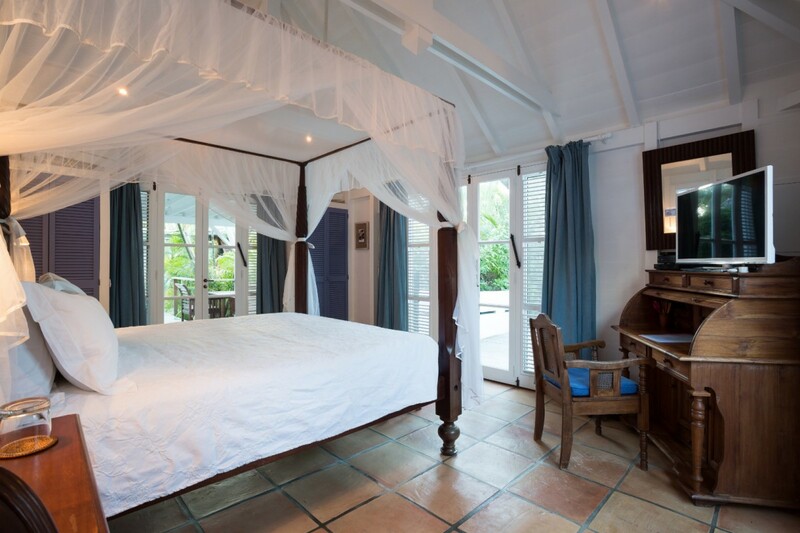 Bedroom 3: Bedroom with a four-poster king-size bed, A/C, ceiling fan, TV, private terrace and en-suite bathroom with shower, vanity and WC. 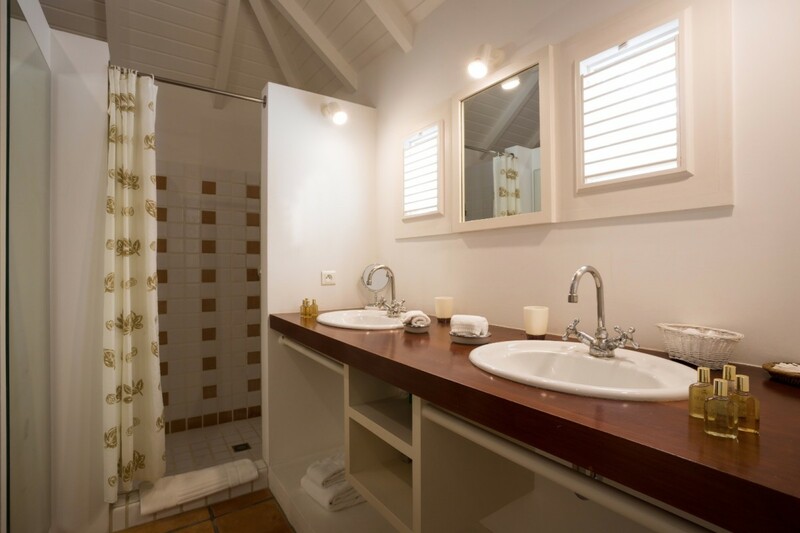 2 guests maximum. 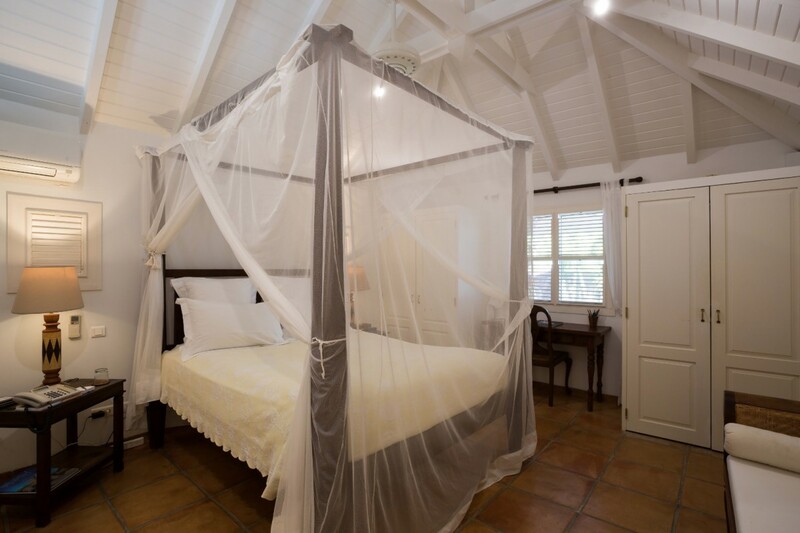 Bedroom 4: Bedroom with a four-poster king-size bed, A/C, ceiling fan, TV, private terrace and en-suite bathroom with shower, vanity and WC. 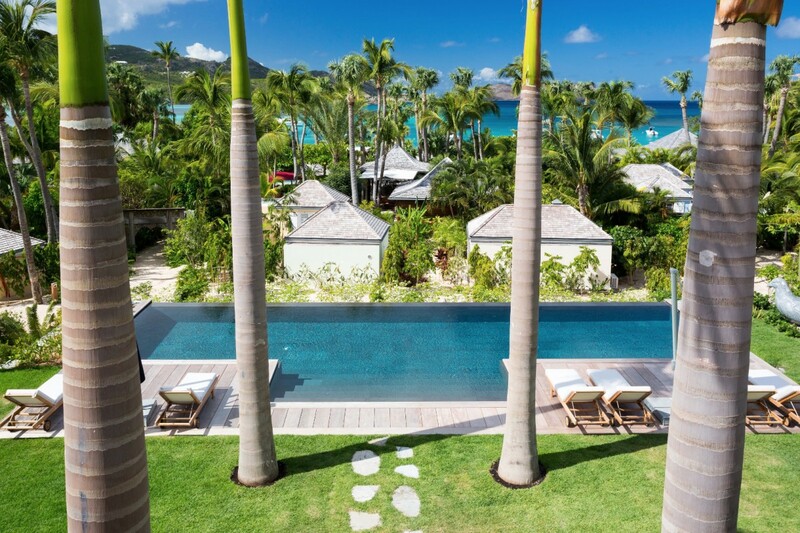 2 guests maximum. 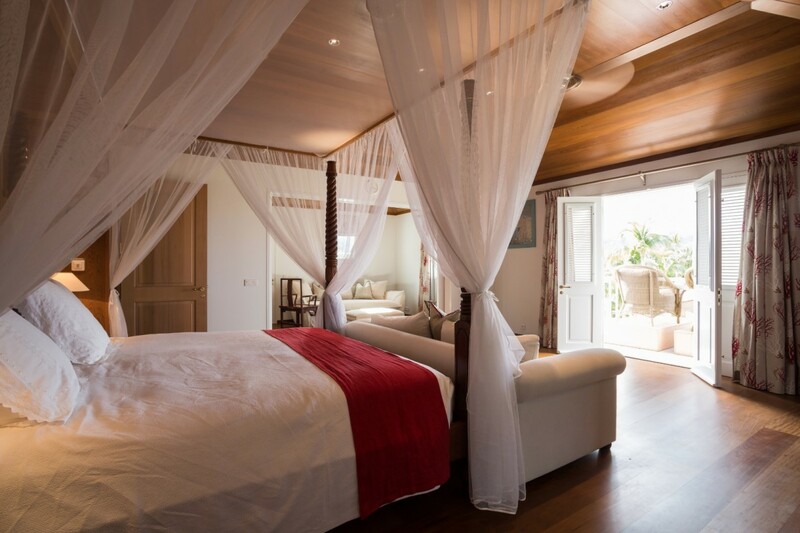 Bedroom 5: Bedroom with a queen-size bed, A/C, ceiling fan, TV, private terrace and en-suite bathroom with indoor and outdoor showers, vanity and WC. 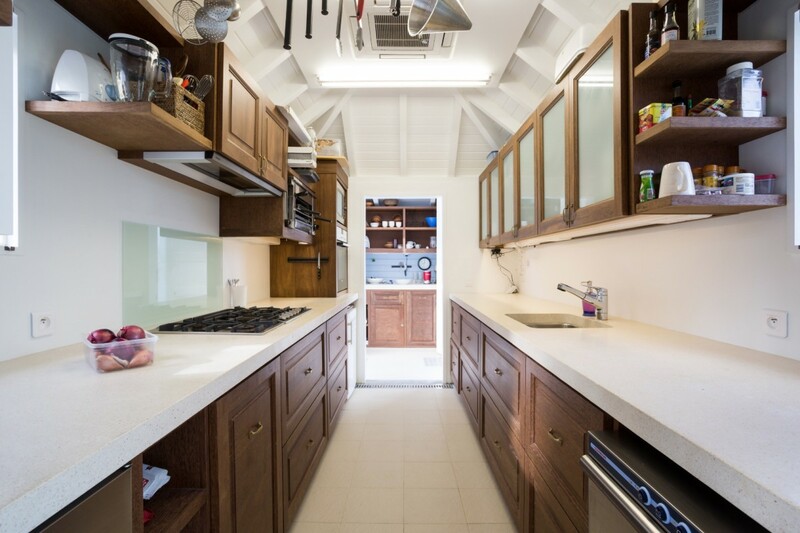 2 guests maximum. 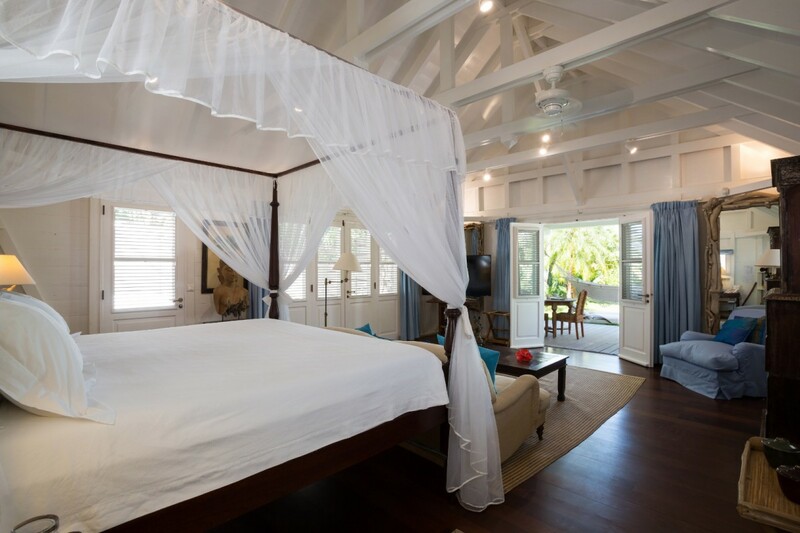 Bedroom 6: Bedroom with a four-poster king-size bed, A/C, ceiling fan, TV, lounge area, private terrace with ocean view and en-suite bathroom with bathtub, shower, vanity and WC. 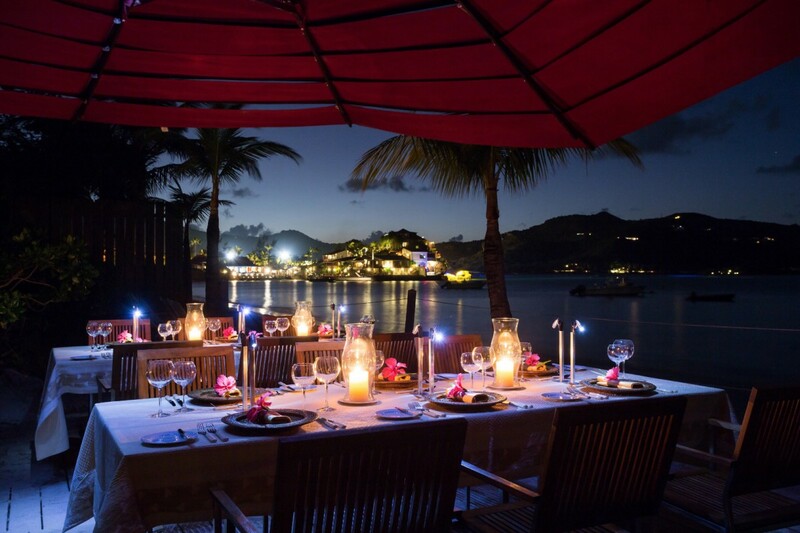 2 guests maximum. 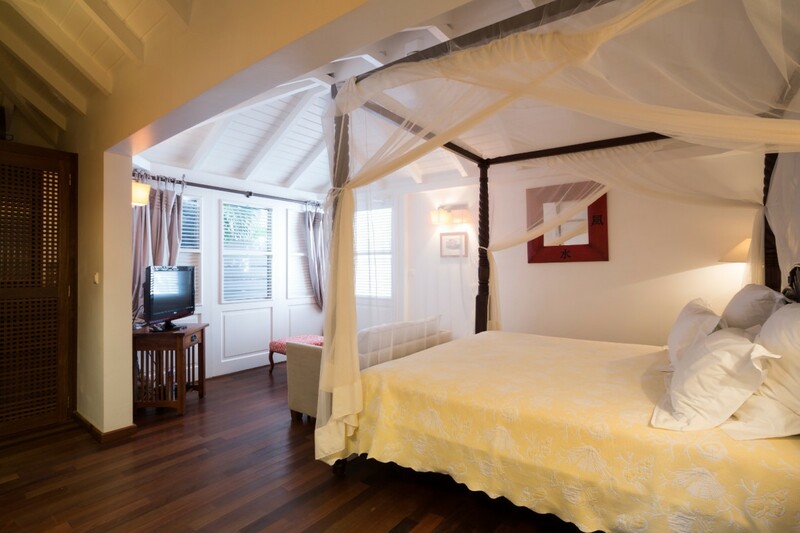 Bedroom 7: Bedroom with a four-poster queen-size bed, A/C, ceiling fan, TV, lounge area, private terrace with outdoor shower and en-suite bathroom with shower, double vanity and WC. 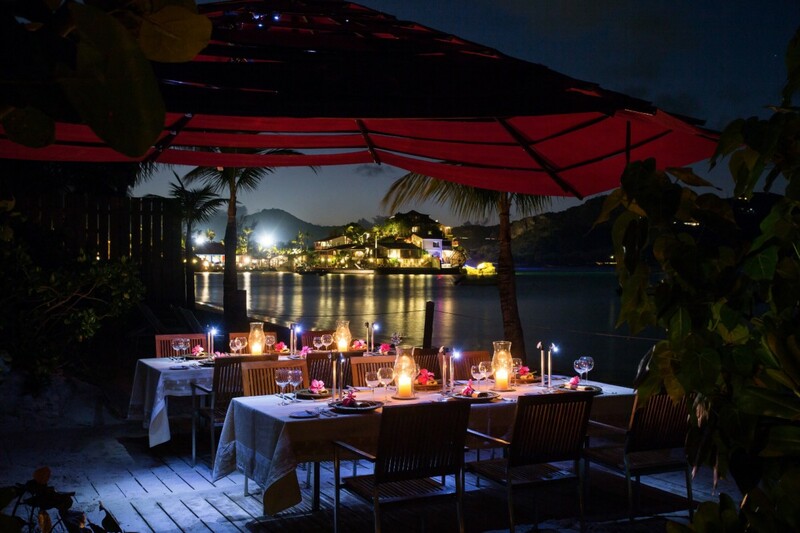 2 guests maximum. 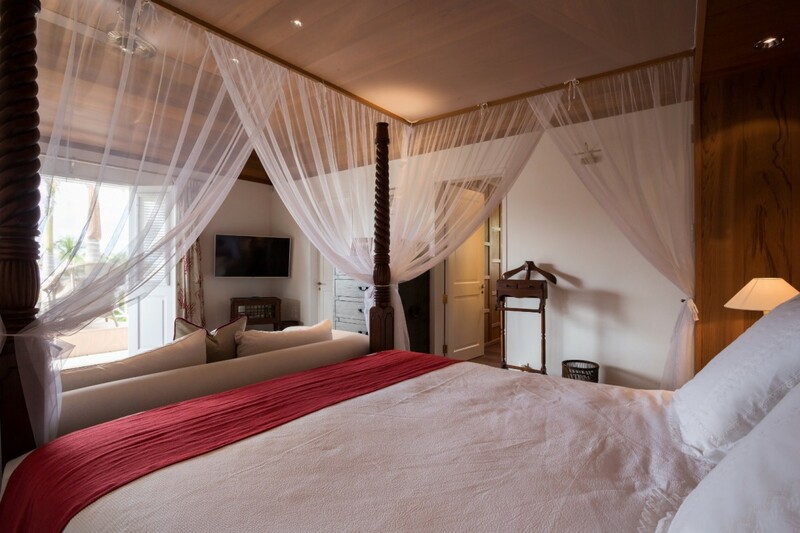 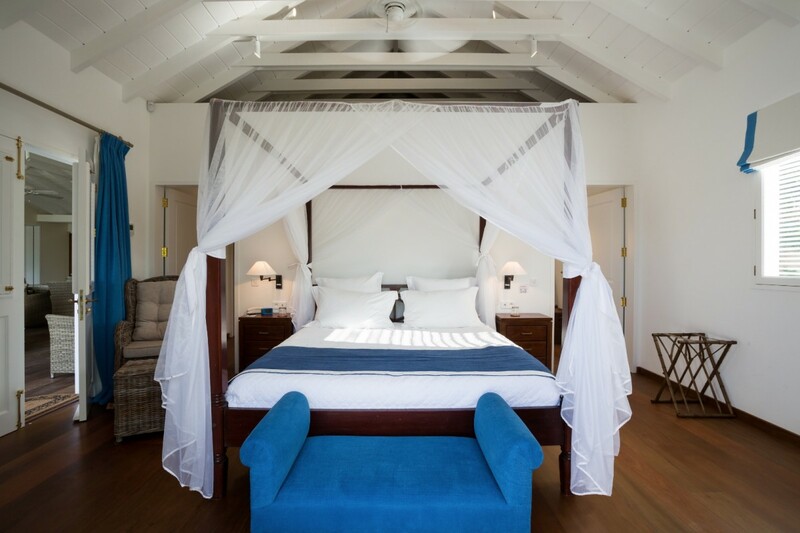 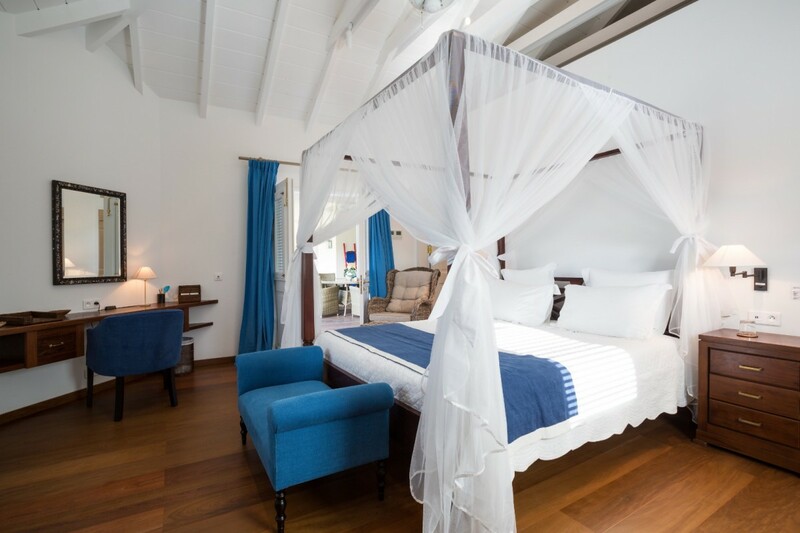 Bedrooms 8 & 9: Bedroom with a four-poster queen-size bed, A/C, ceiling fan, lounge area with TV, private terrace with outdoor shower and en-suite bathroom with shower, double vanity and WC. 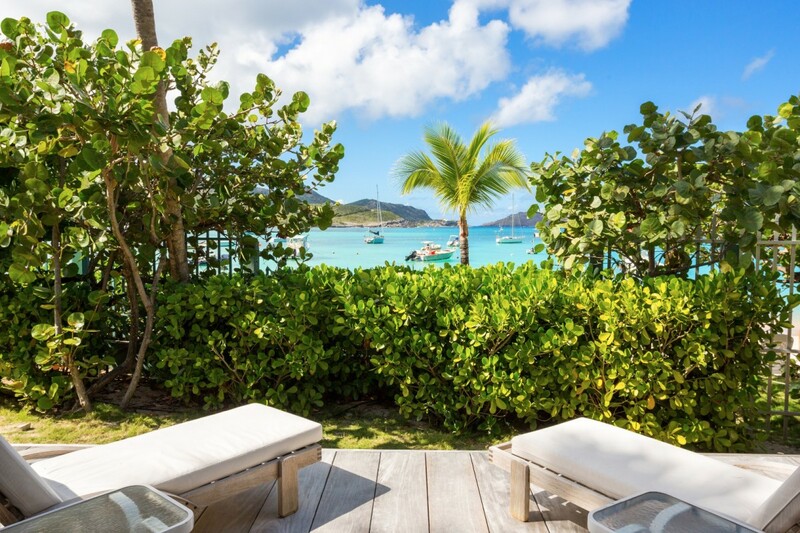 2 guests maximum. 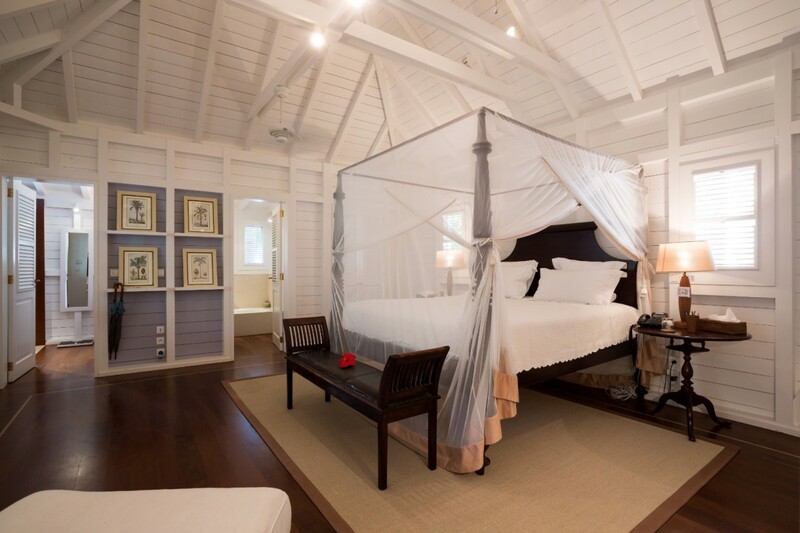 Bedroom 10: Bedroom with a four-poster king-size bed, A/C, ceiling fan, TV, private terrace and en-suite bathroom with shower, vanity and WC. 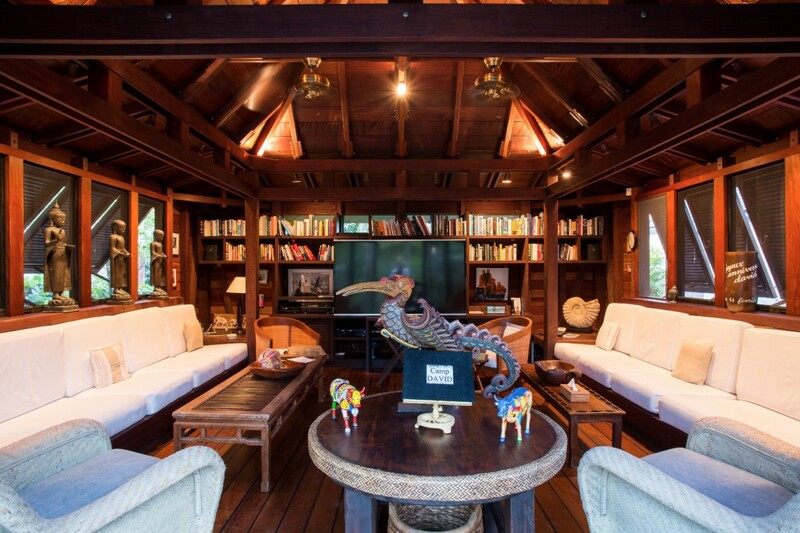 2 guests maximum. 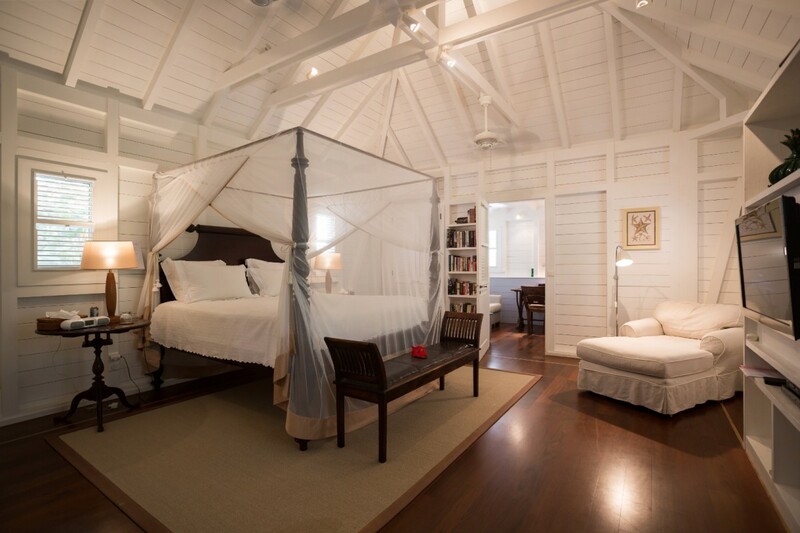 Bedroom 11: Bedroom with 2 four-poster single beds, A/C, ceiling fan and en-suite bathroom with shower, vanity and WC. 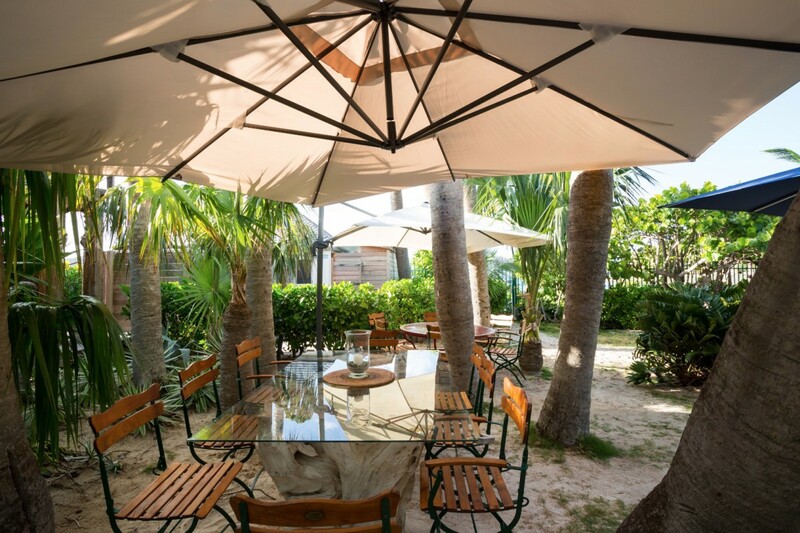 2 guests maximum.